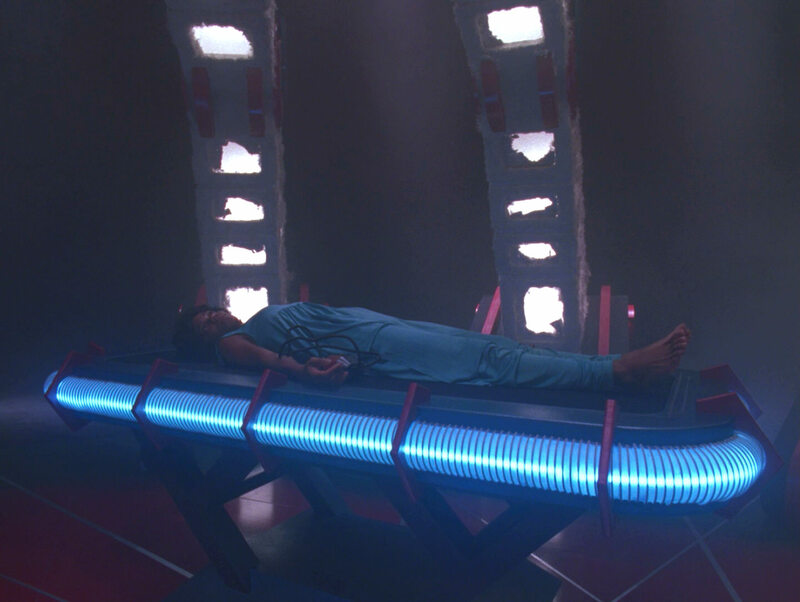 Ex Astris Scientia - Observations in TNG: "Schisms"
Here are some observations about sets, props and visual effects in TNG: "Schisms" without a specific theme, and a comparison of the original TV release (TNG) with the remastered episode (TNG-R). 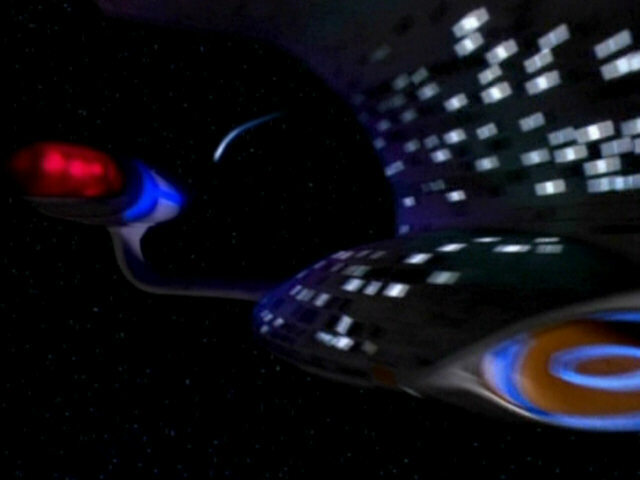 The shot of the USS Enterprise-D approaching the Amargosa Diaspora originally appeared in the season 2 episode "Pen Pals", where the ship is seen exploring the Selcundi Drema sector. 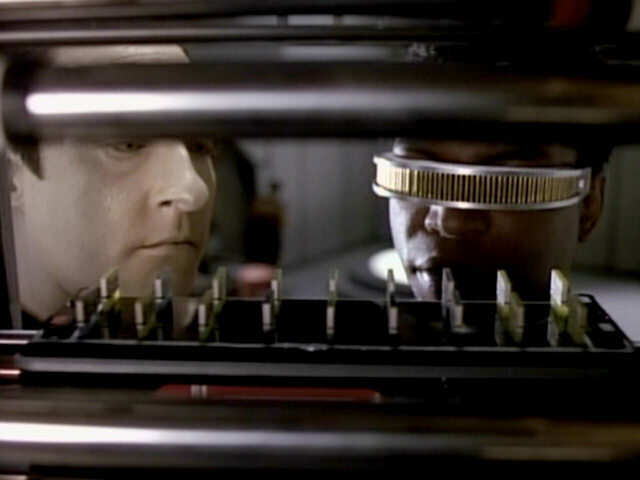 "Pen Pals" The space shot in HD. 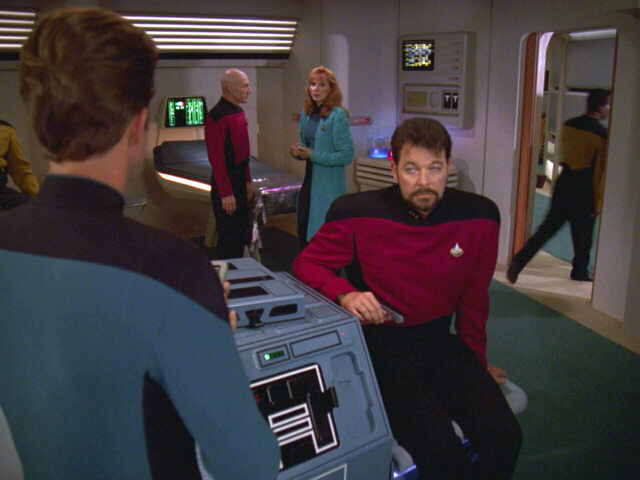 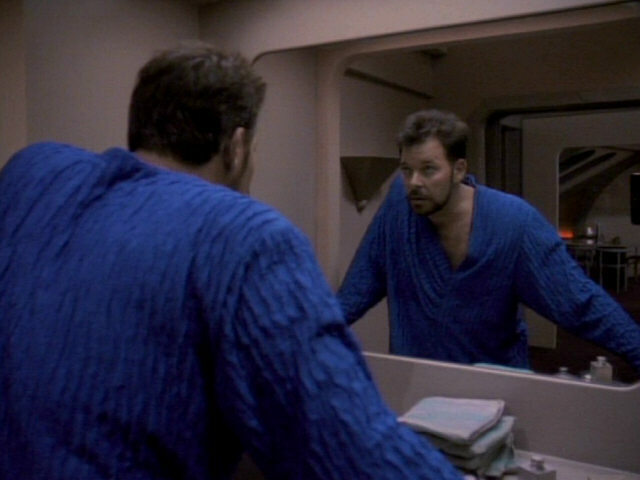 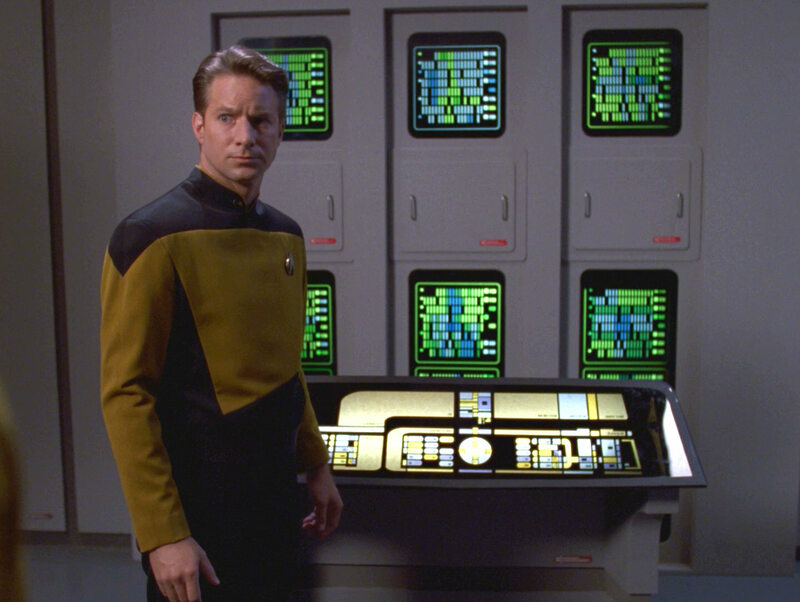 Filming equipment is reflected in the right sight of the mirror as Riker looks at the same. 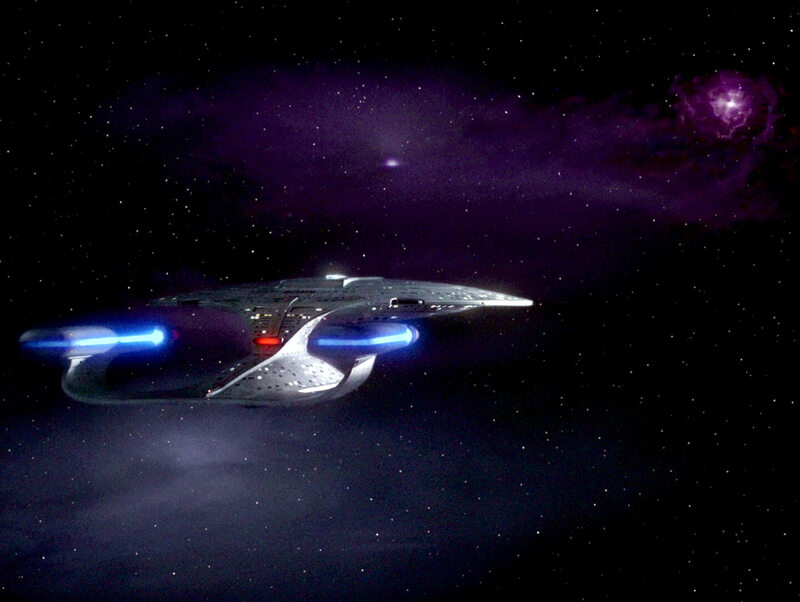 This can be seen even better in HD. 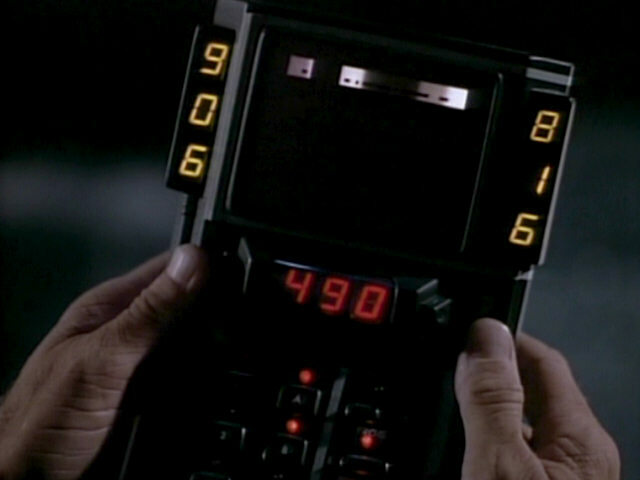 This digital clock only appears in this one episode. 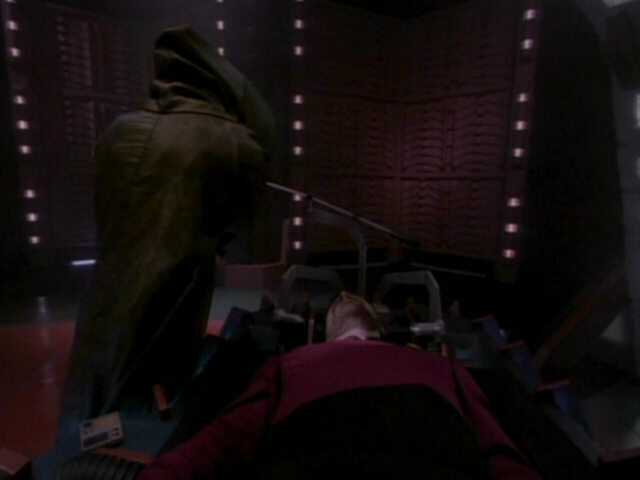 The time was added in post production, explaining why the footage is rather grainy. 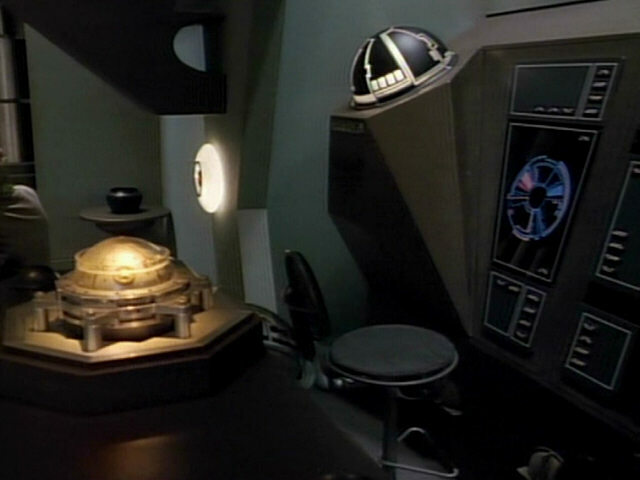 The display was reconstrcuted for TNG-R.
A map of the Amargosa Diaspora is displayed on the small engineering monitor on the "pool table". 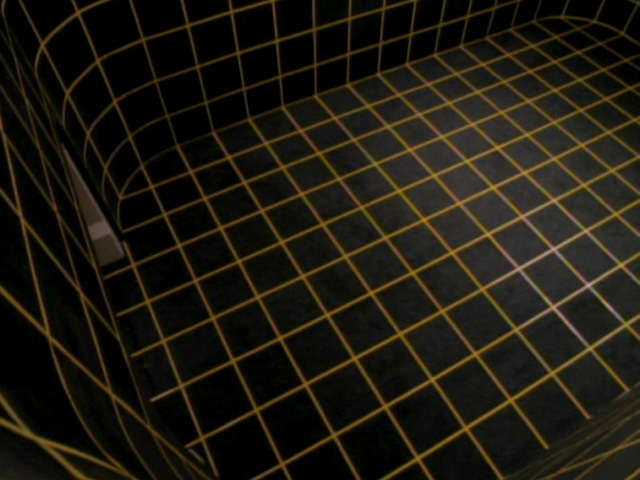 The dispplay in HD. 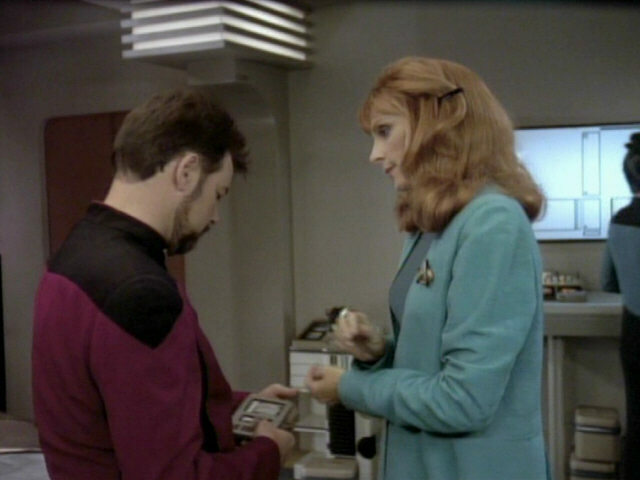 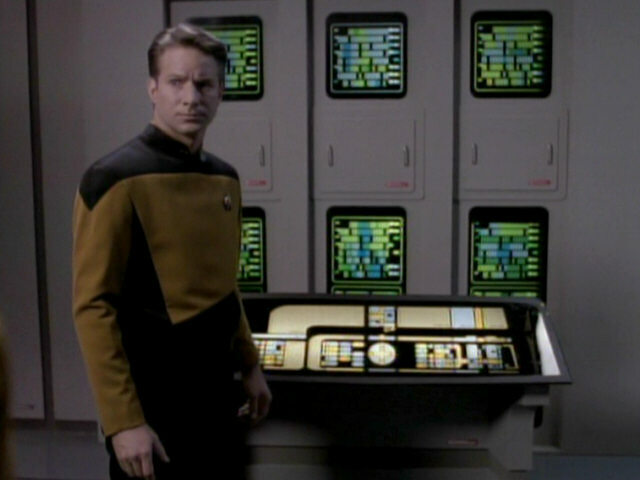 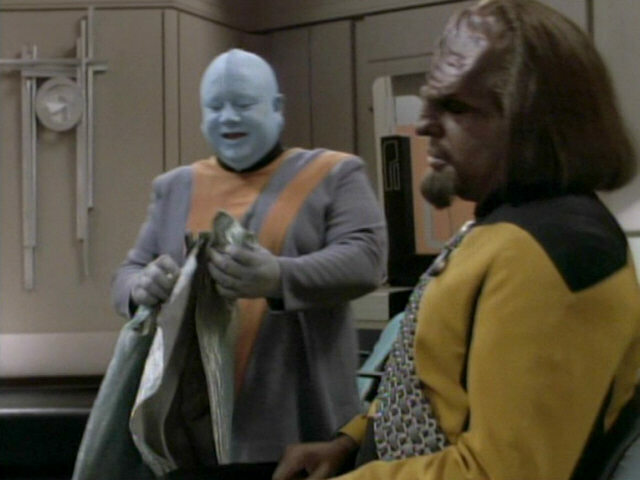 The small PADD with white print, given by Crusher to Riker here, also appeared in the medical lab in "Time's Arrow II". 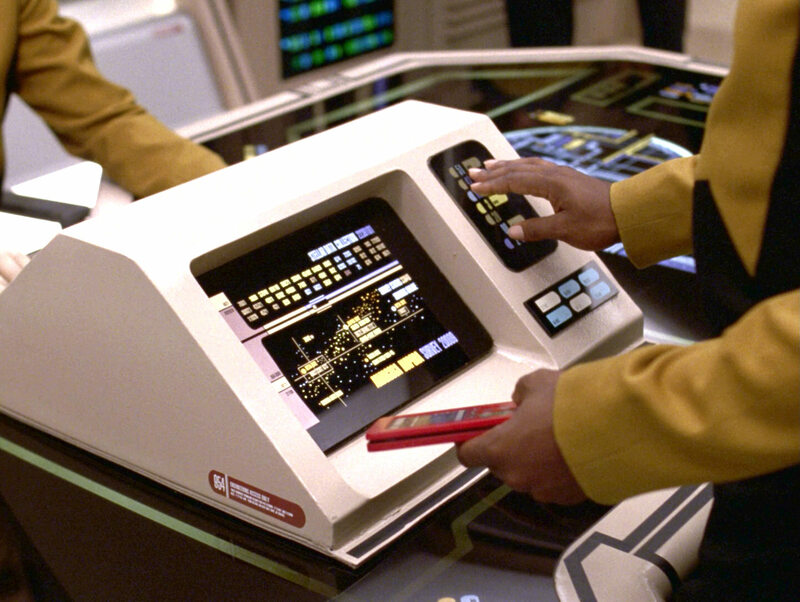 "Time's Arrow II" A better look at the PADD in HD. 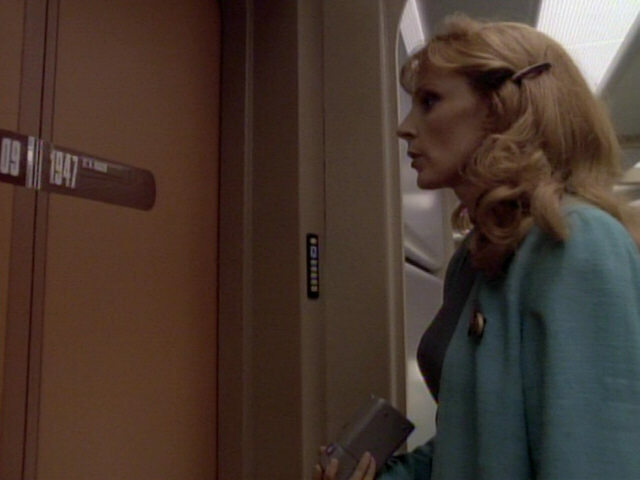 The door that leads to the main engineer's office can be seen very well in the background again in this shot. 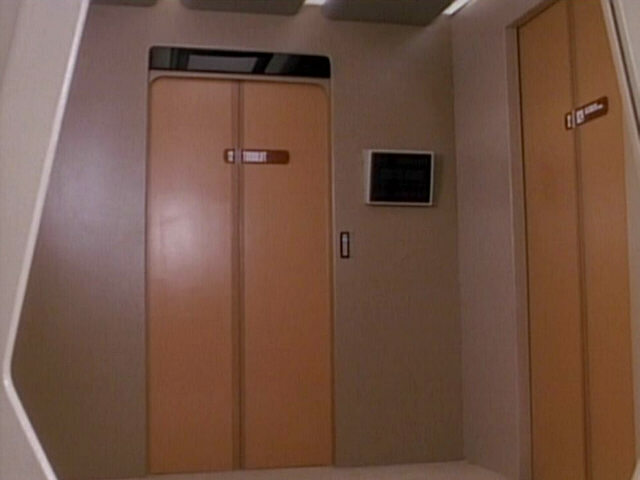 In reality, the door led to the right side door in the small turbolift alcove opposite the transporter room corridor. 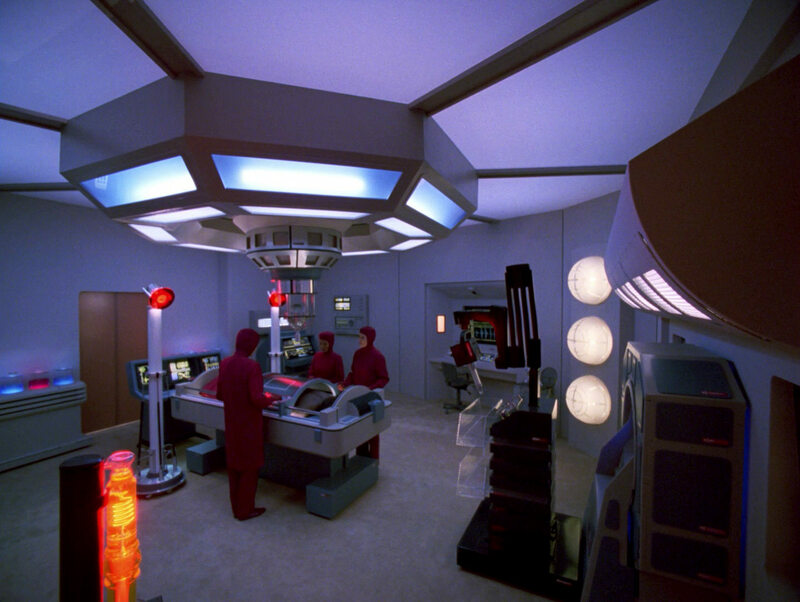 A good look at the MSD and one of the two corridors leading to it. 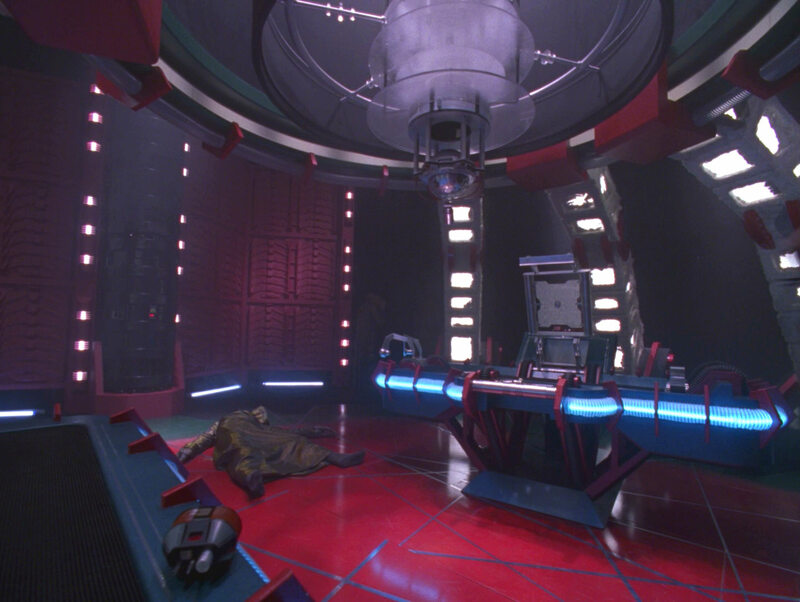 The compairon screenshot from two seasons earlier ("Remember Me") shows what the same part of the set looked like back then. 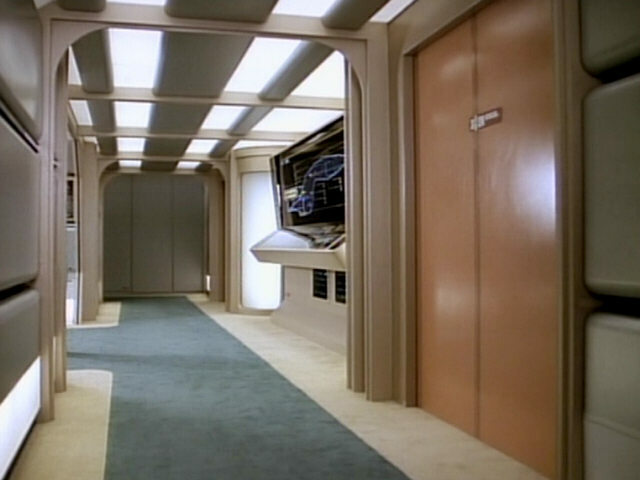 The carpet and the back wall of the side corridor have noticeably been changed. 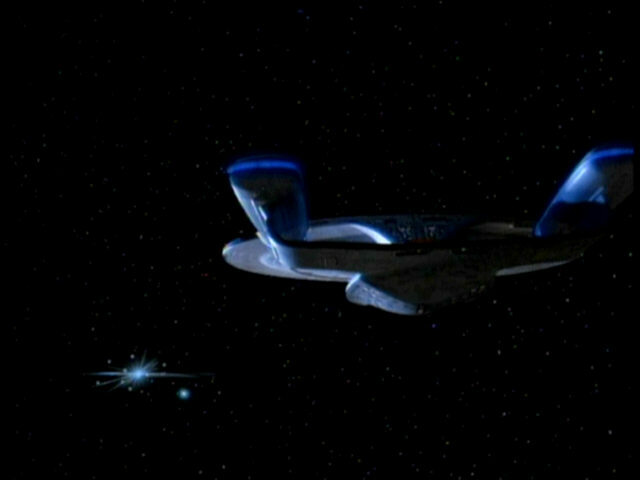 This had already been changed later in season 4, however, as can be seen in the screenshot from "Galaxy's Child". 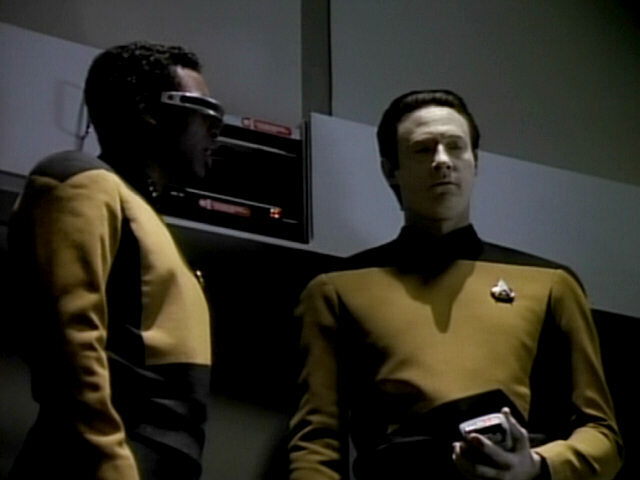 "Galaxy's Child" In HD, the masking tape, used to hide some of the injokes, can also be made out. 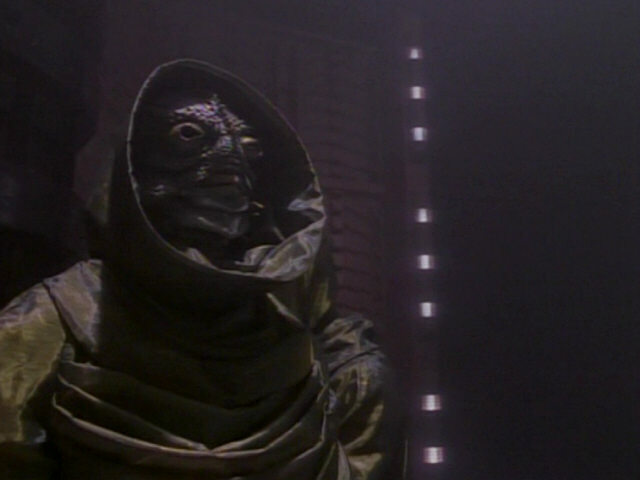 Nomad, however, remains unmasked in both versions of the episode. 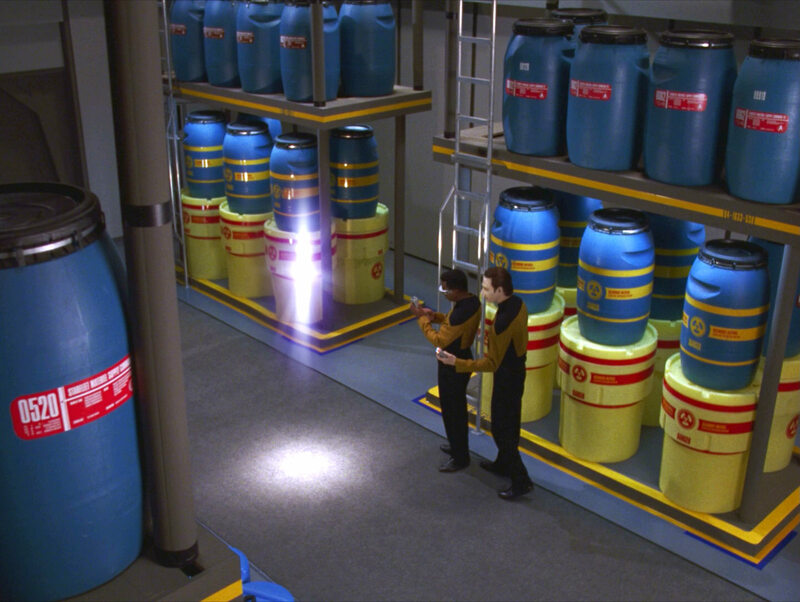 Cargo bay 4 is highlighted in the second screenshot of the MSD. 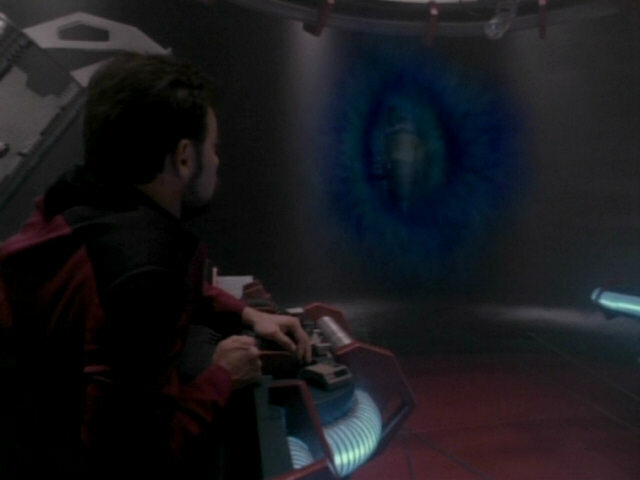 The flashing red light was added in post production. 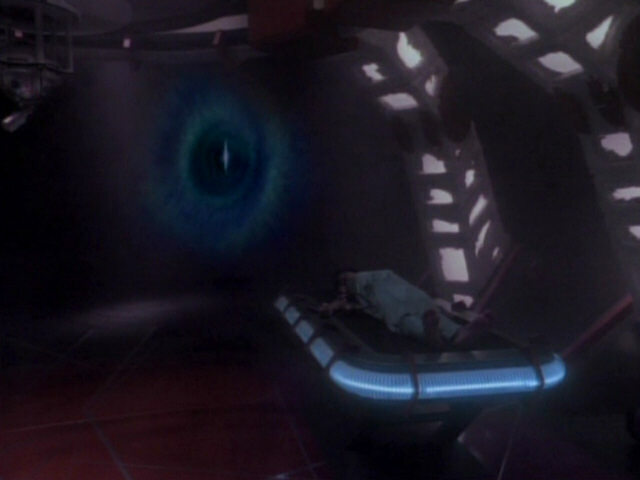 In HD, the location of cargo bay 4 has been changed. 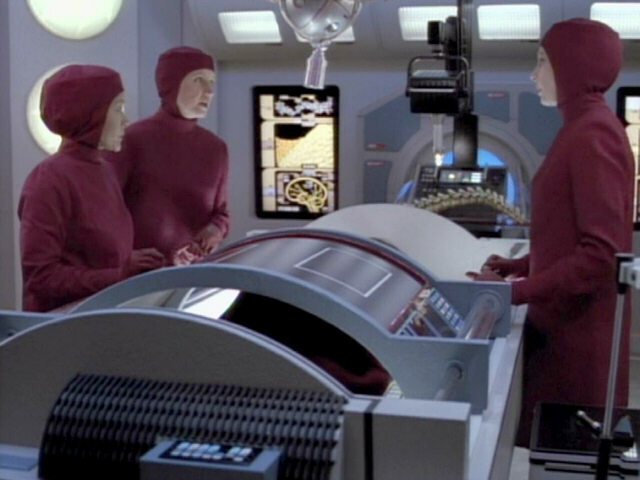 In the original display, the saucer impulse engines had been incorrectly identified as cargo bay 4. 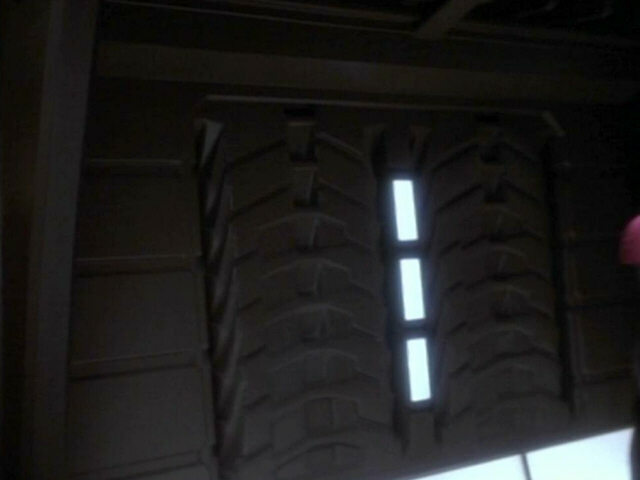 Now cargo bay 4 is located one deck below shuttlebay 1. 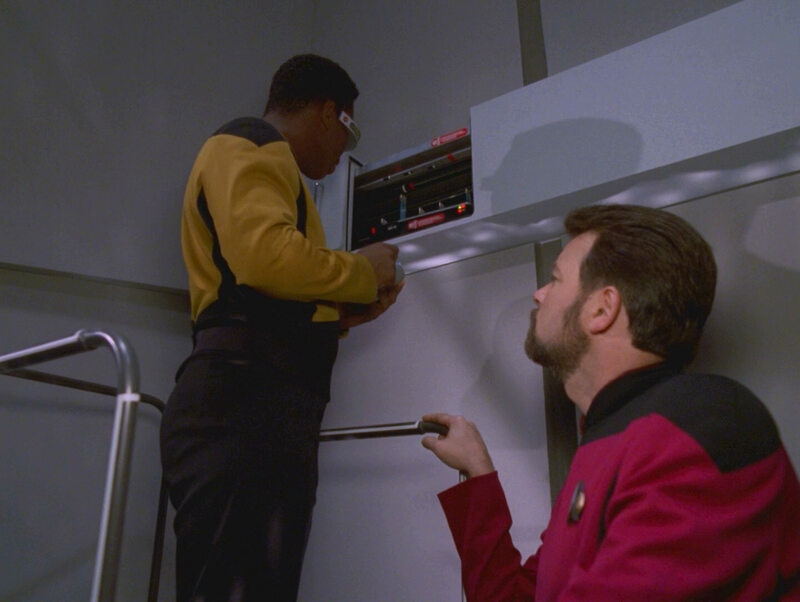 The back wall of the replicator now seems to be covered with a non-reflective black material. 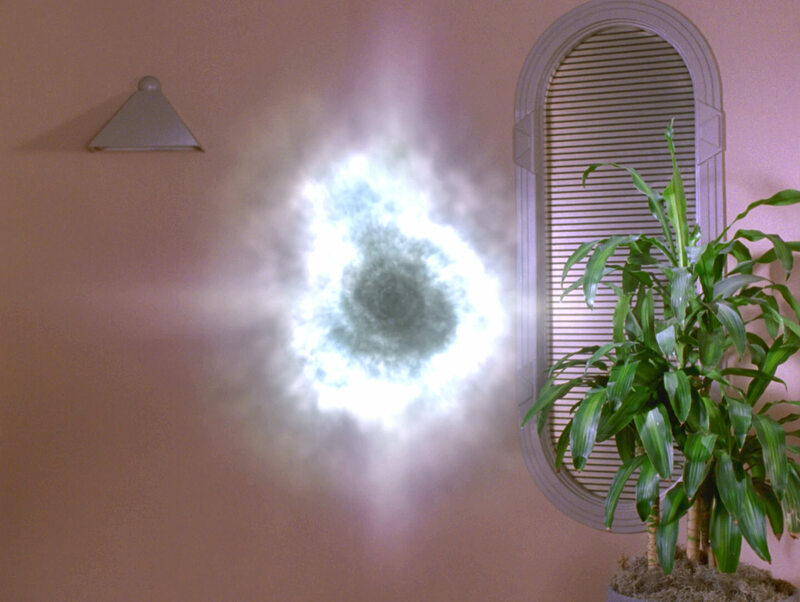 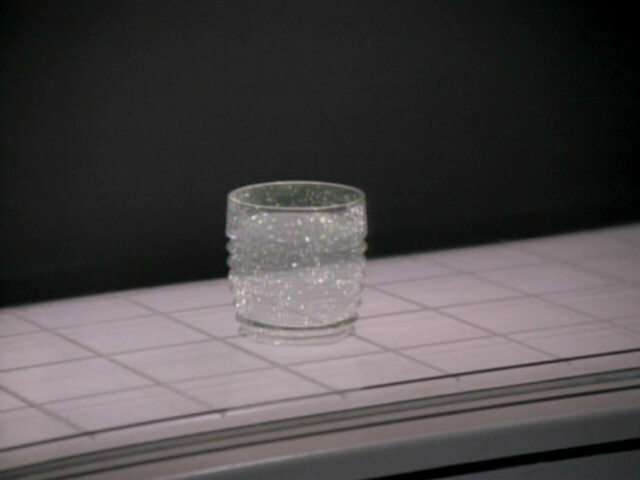 In earlier seasons, the back wall was highly reflective, making it necessary to add the sparkling replicator effect in the reflection as well. 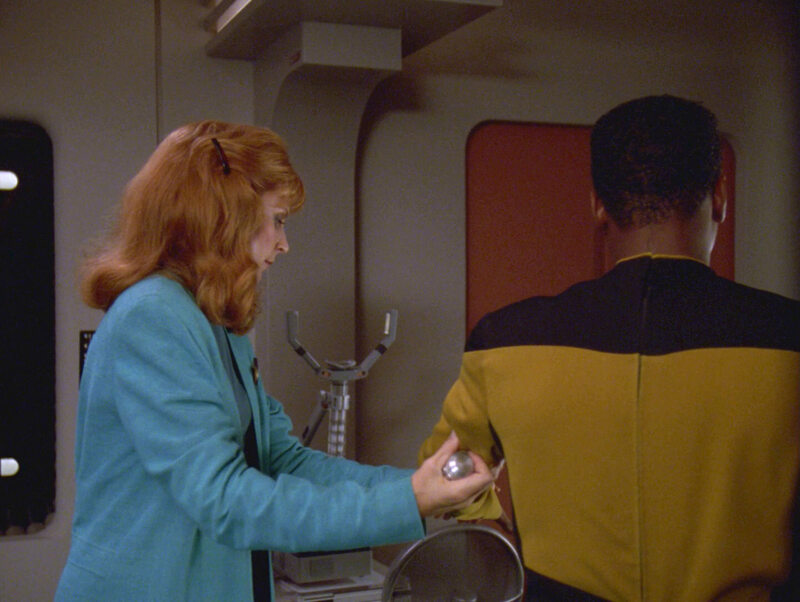 Again, this is a change that was also evident earlier in the series. 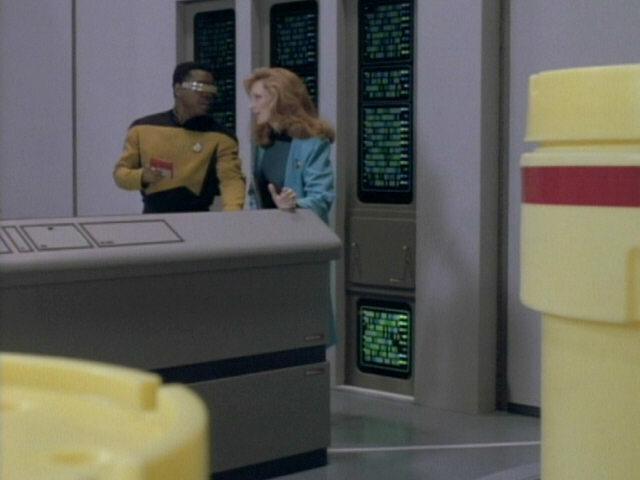 The non-reflective back wall also appeared in "Cost of Living". 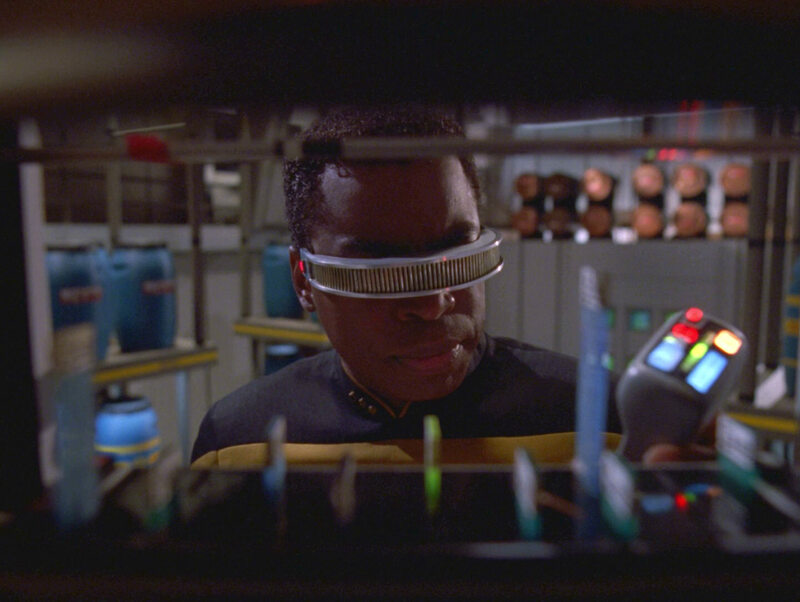 "Violations" The replicator in HD. 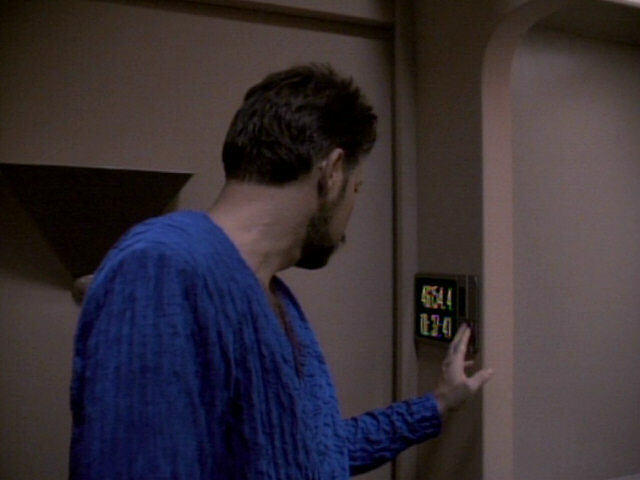 The label on Riker's door can be seen in this shot. 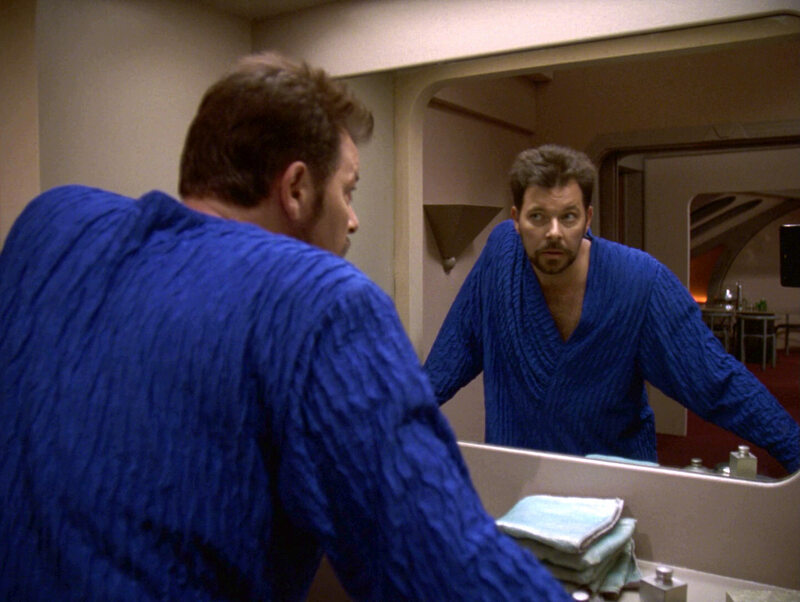 In HD, it can be made out that it reads "Commander William T. Riker - Executive Officer". 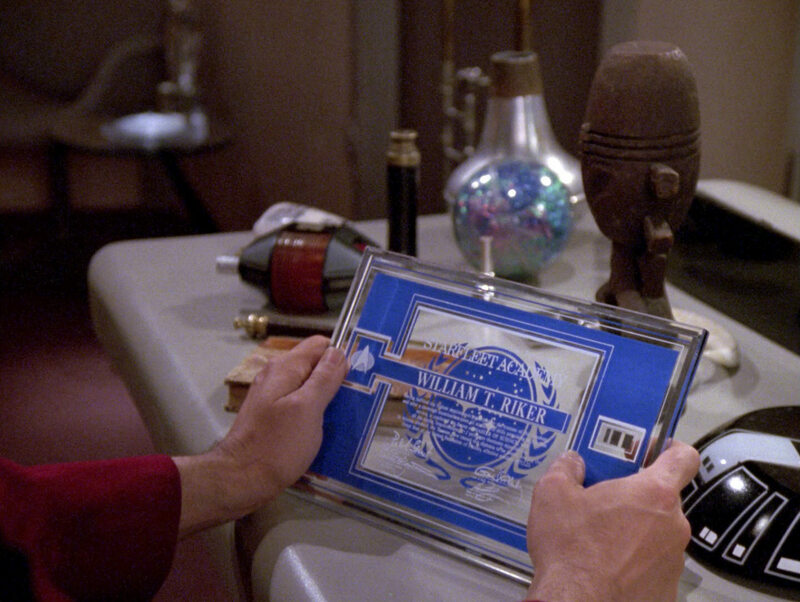 The barbershop now features a piece of wall decoration originally found in Neral's office in "Unification I+II". 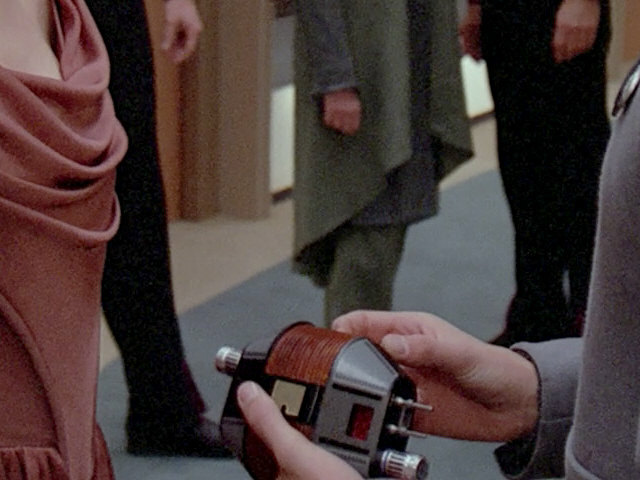 This piece of art has appeared in several other Star Trek episodes. 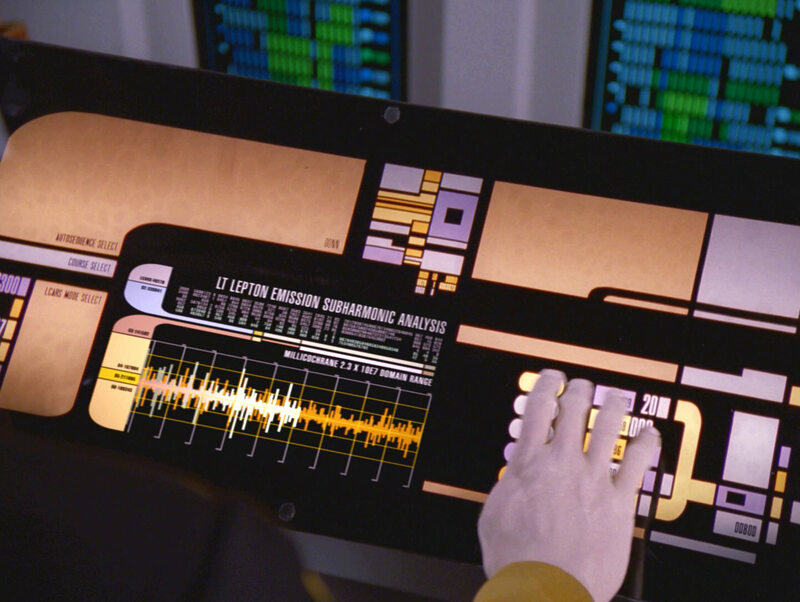 It was last seen aboard the USS Enterprise-D in "Violations" in the dining room. 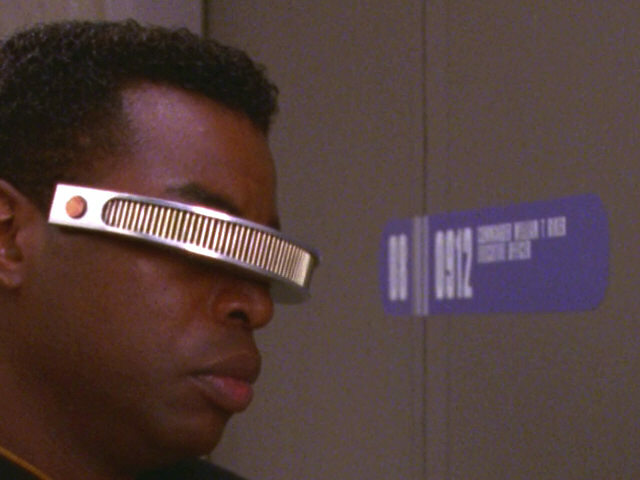 "Violations" The barbershop in HD. 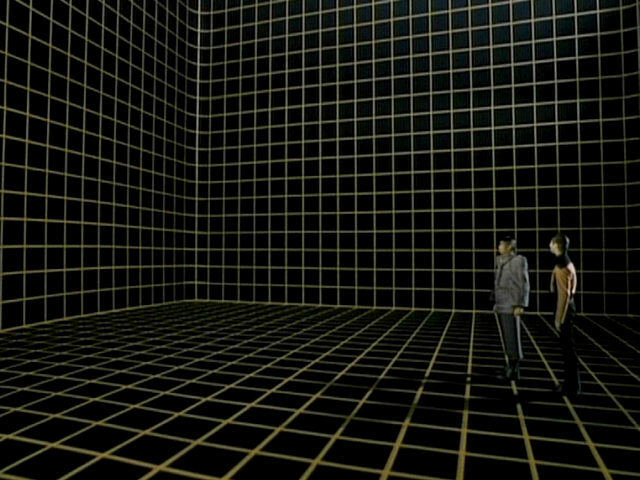 The box filled with isolinear chips was first seen in "The Mind's Eye". 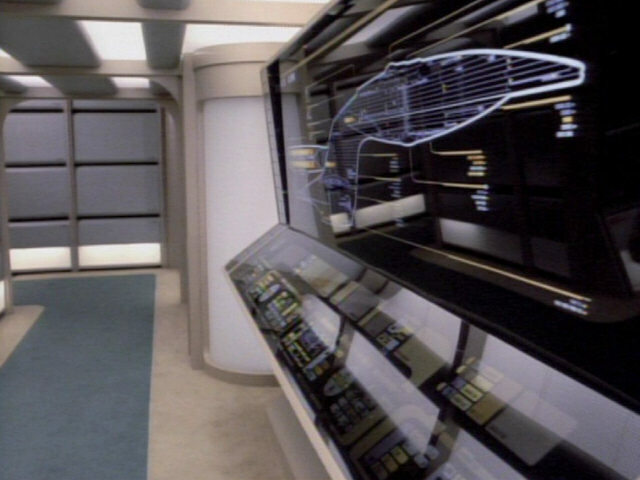 It later appeared in several more episodes, usually when a wall cover was removed and isolinear circuitry was seen behind it. 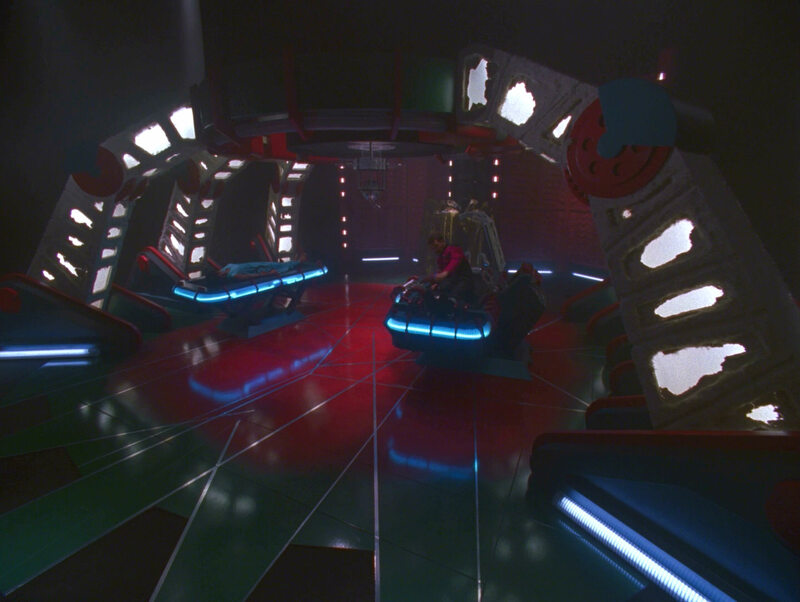 "New Ground" A better look at the circuitry in HD. 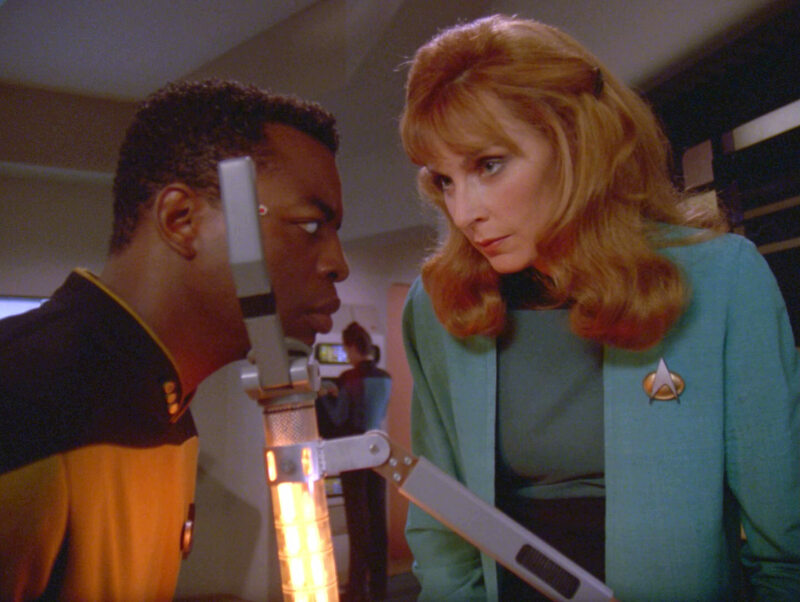 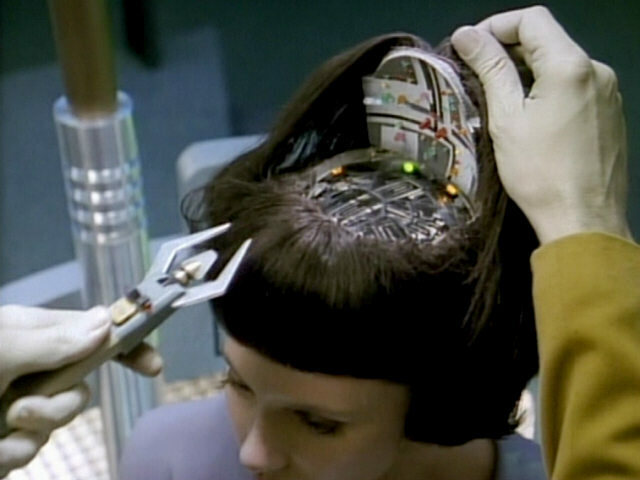 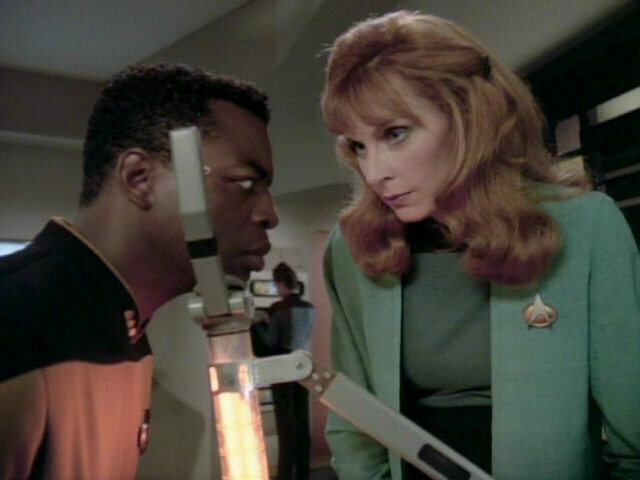 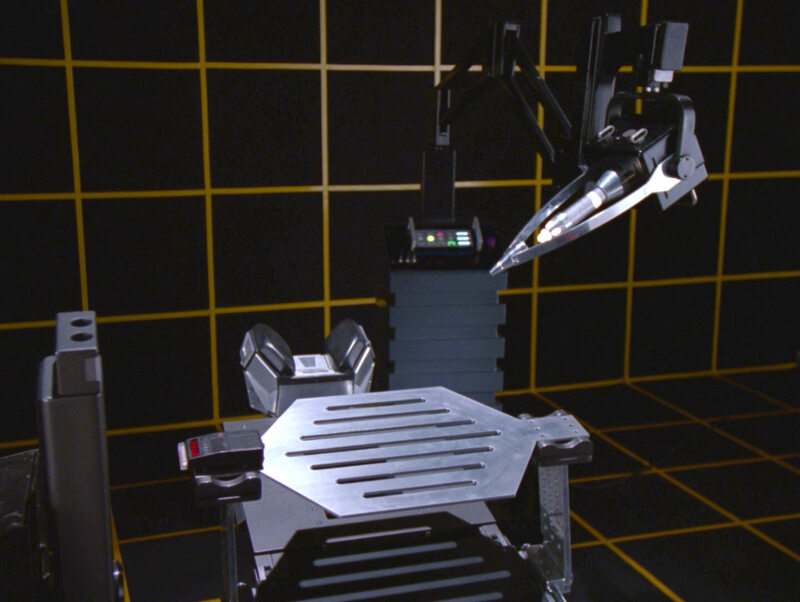 Doctor Crusher last used this scanner to examine Geordi's neural implants in "Cause and Effect". 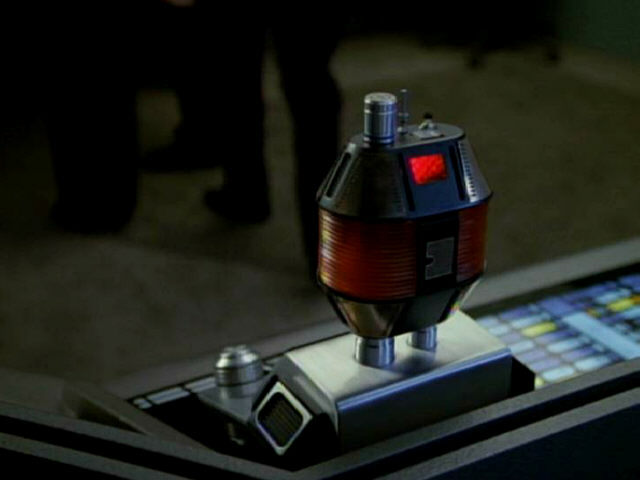 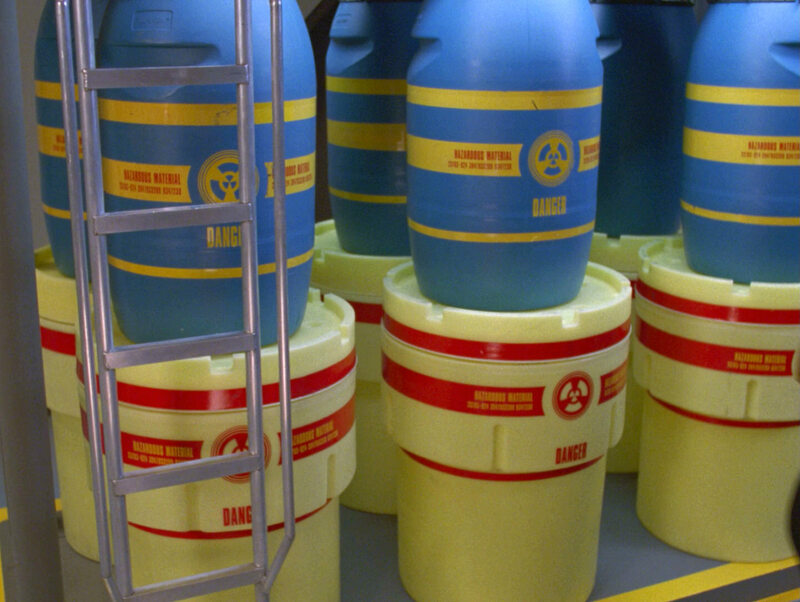 In that episode, the prop was enhanced in post production. 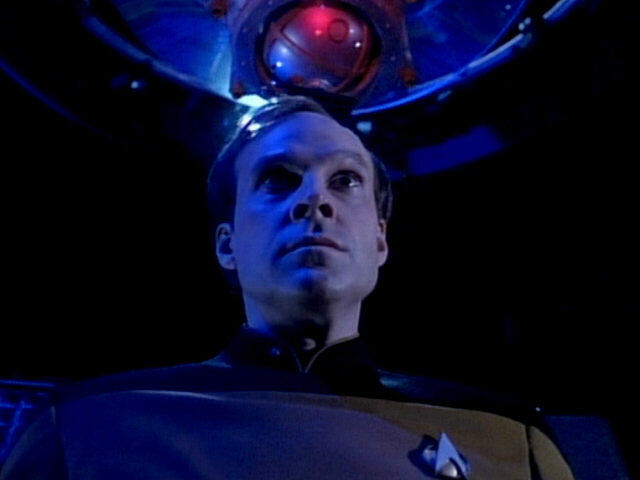 and Effect" The scanner in HD. 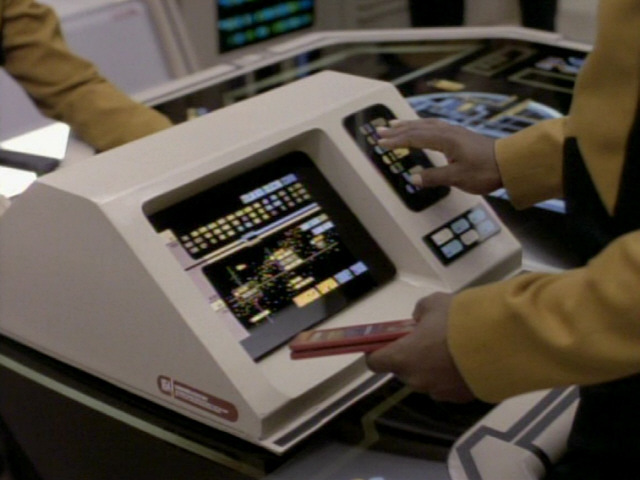 A nice close-up of the conn station. 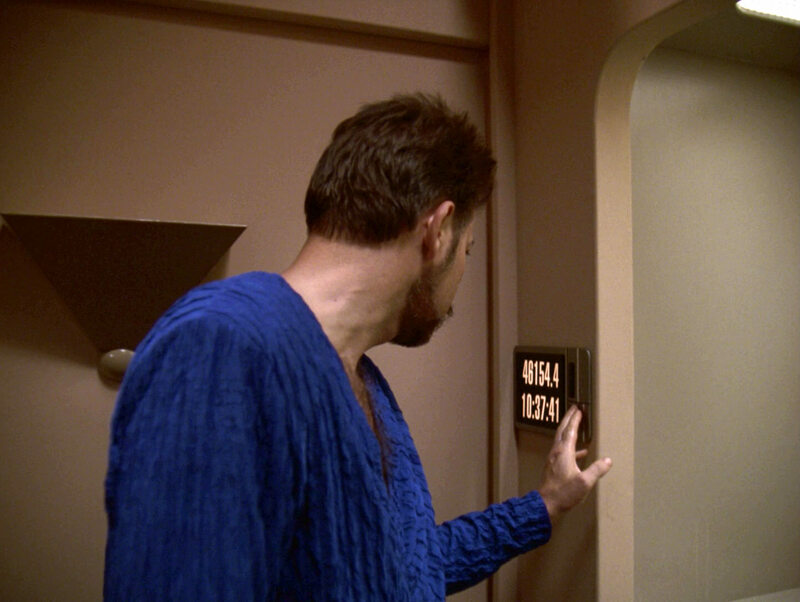 In HD, the text is perfectly legible. 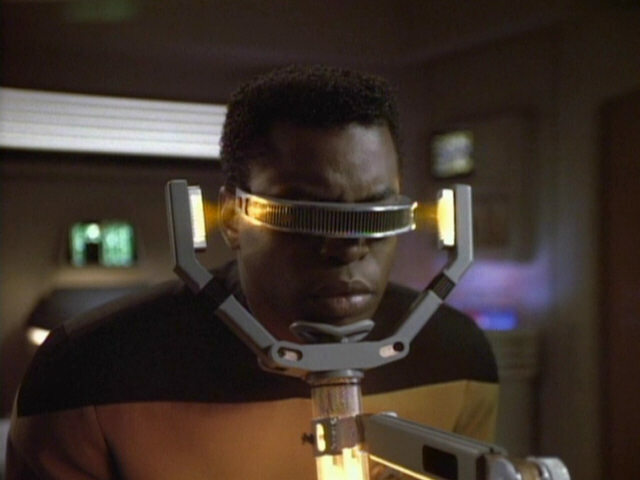 Well, and we can see the screws that were apparently masked for the SD version. 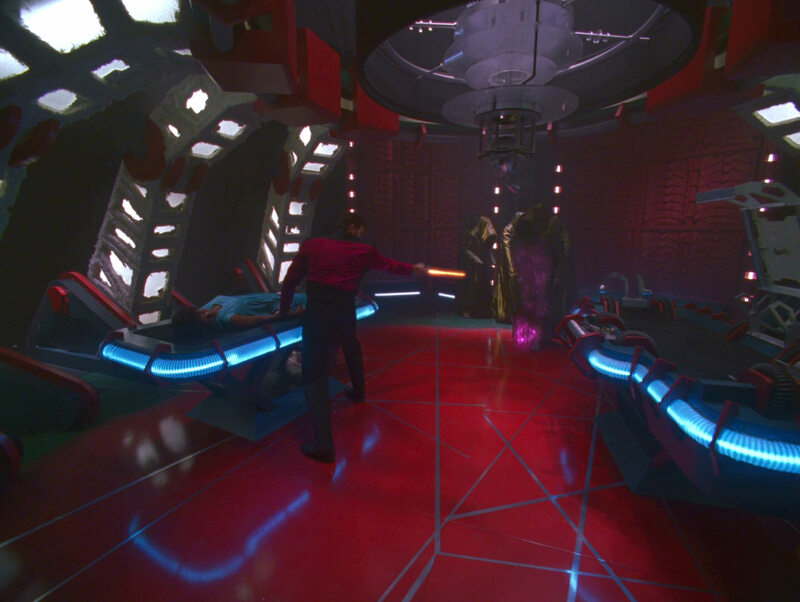 The warping effect of the subspace particle emission was added in post production. 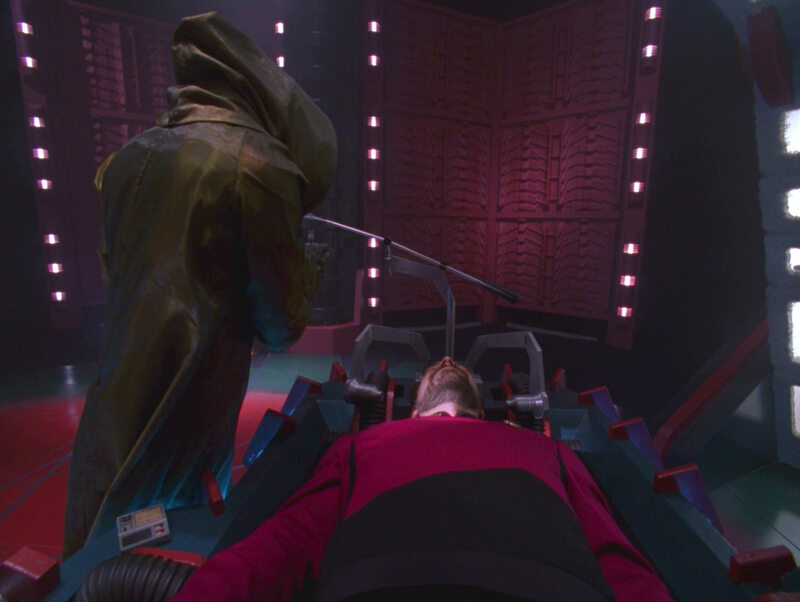 The effect was redone for TNG-R. 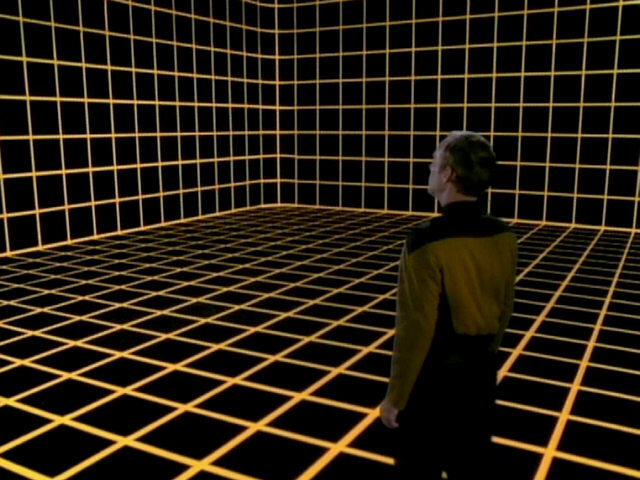 The real size of a small holodeck can be seen very well in these two screenshots. 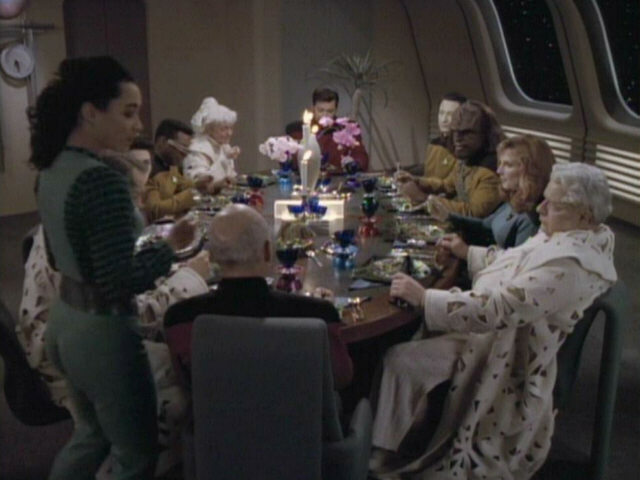 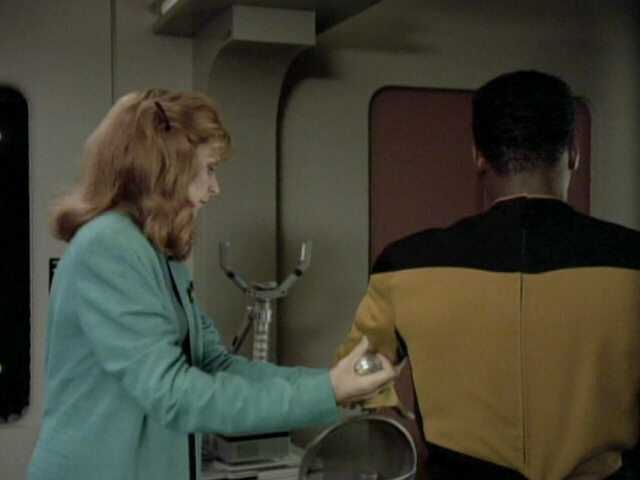 In earlier episodes, much larger holodecks were seen. 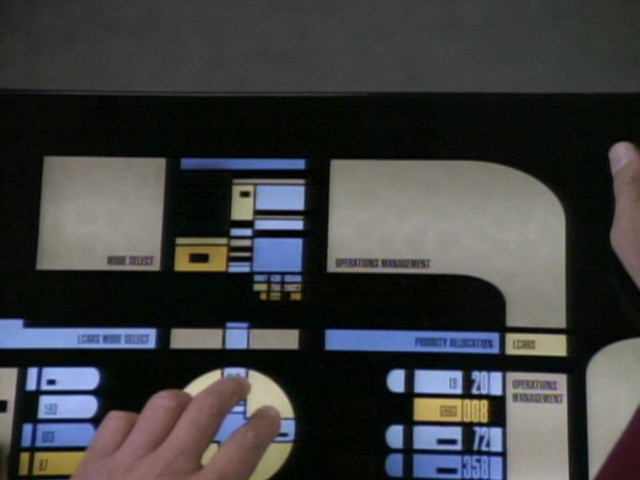 The small interface added to the table during this scene seems rather old-fashioned with its LCD numbers. 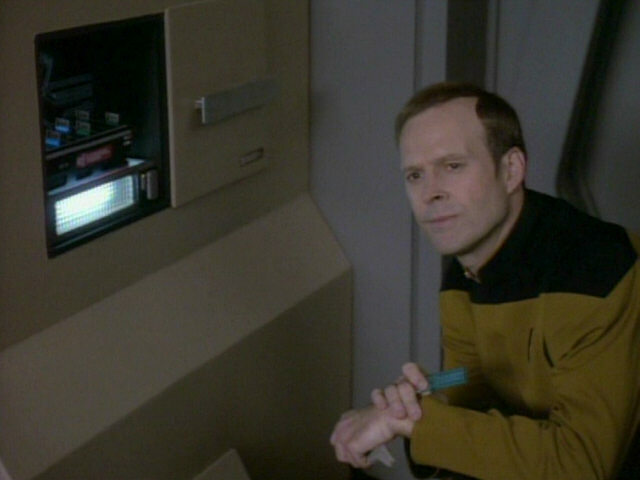 A similarly low-tech scanner appeared in "The Child". 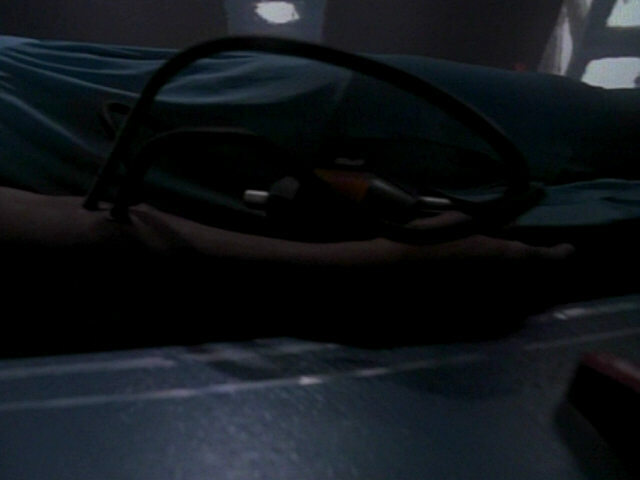 "The Child" The equipemnt in HD. 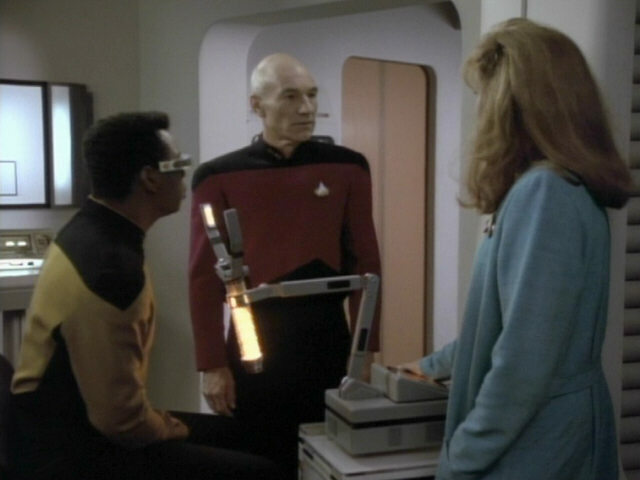 The swing arm has been seen before in several TNG episodes. 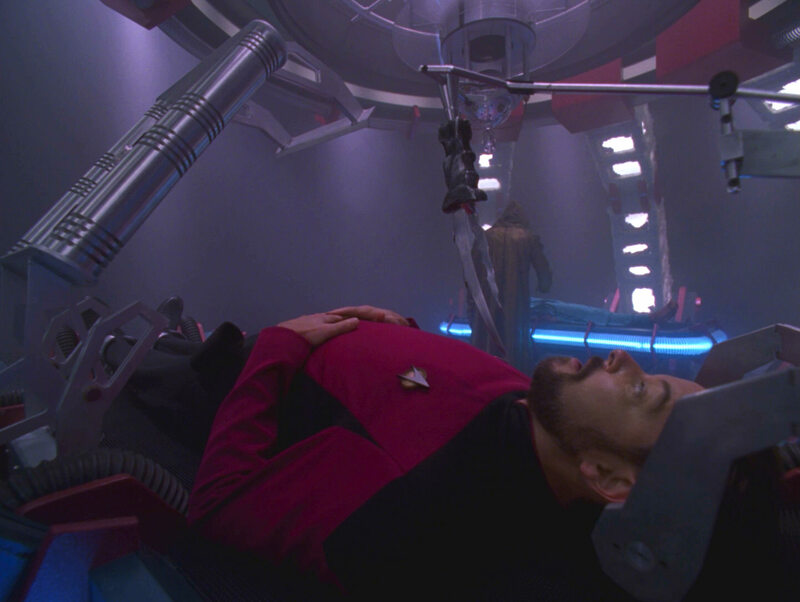 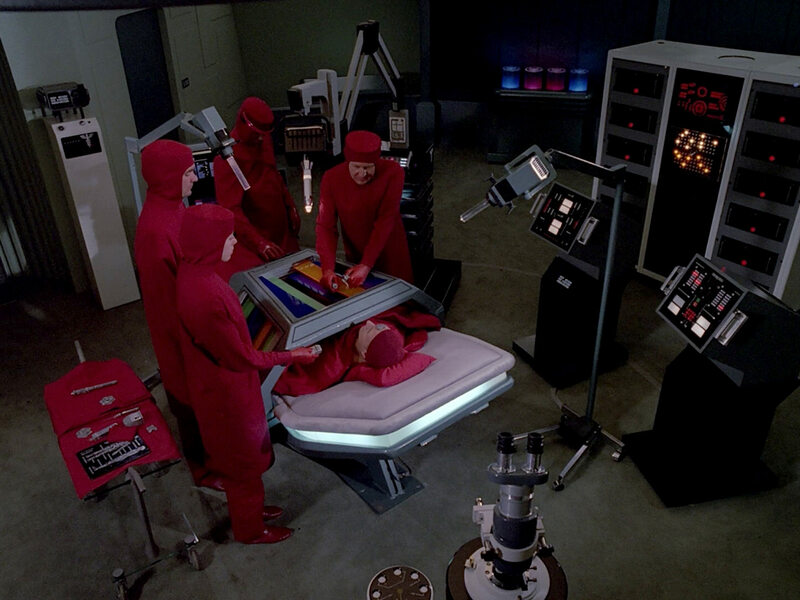 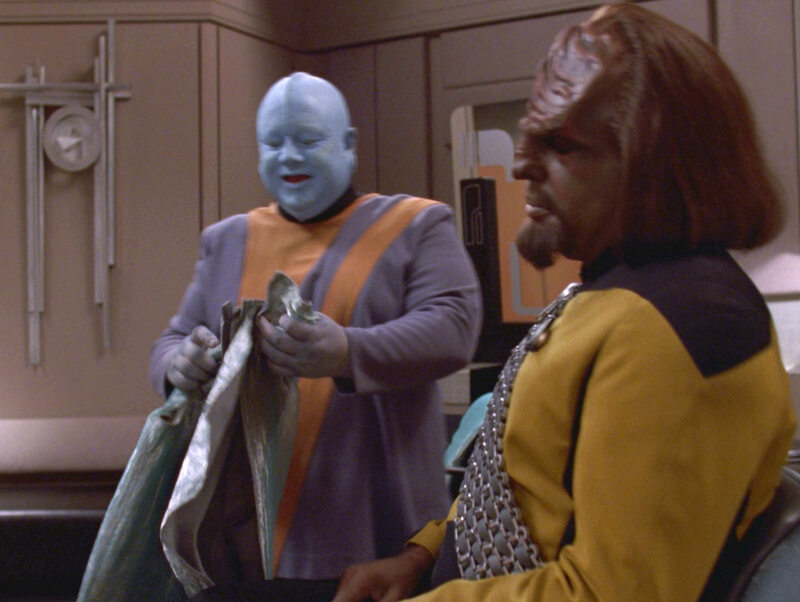 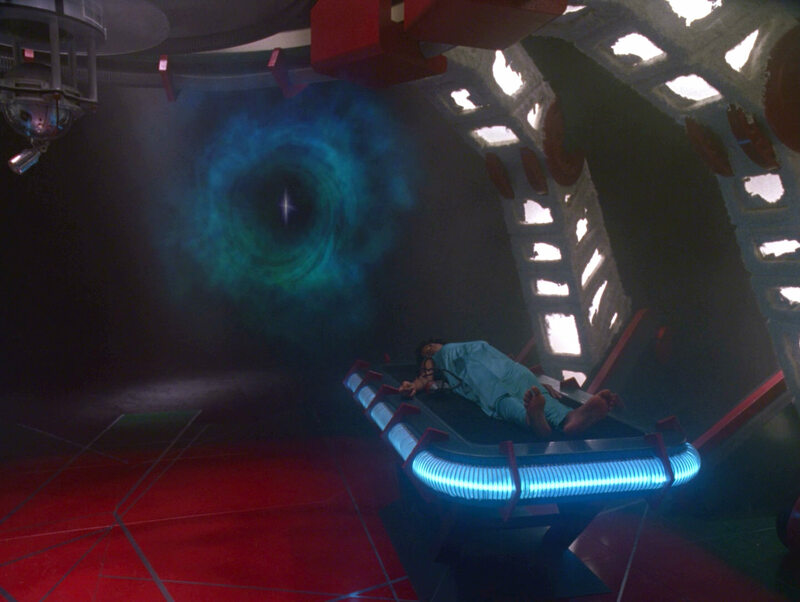 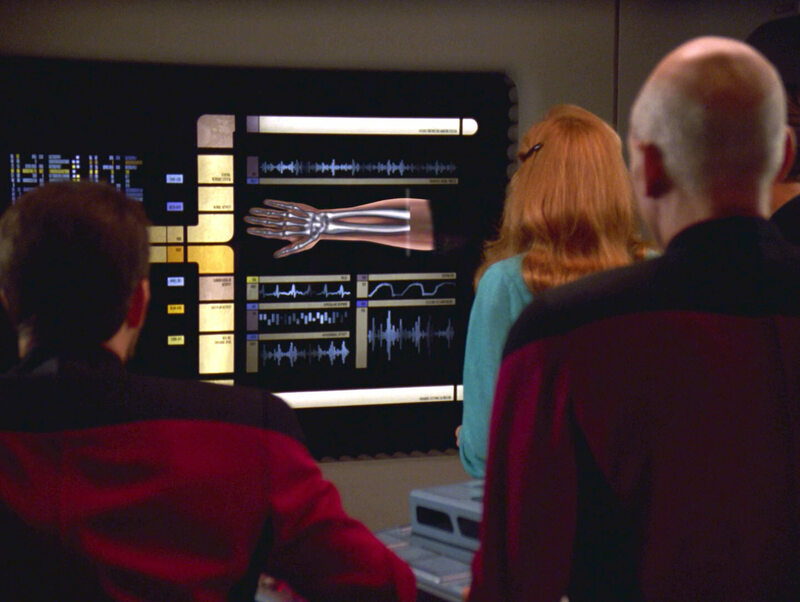 It was used during Picard's heart operation in "Samaritan Snare" and Worf's spine replacement in "Ethics". 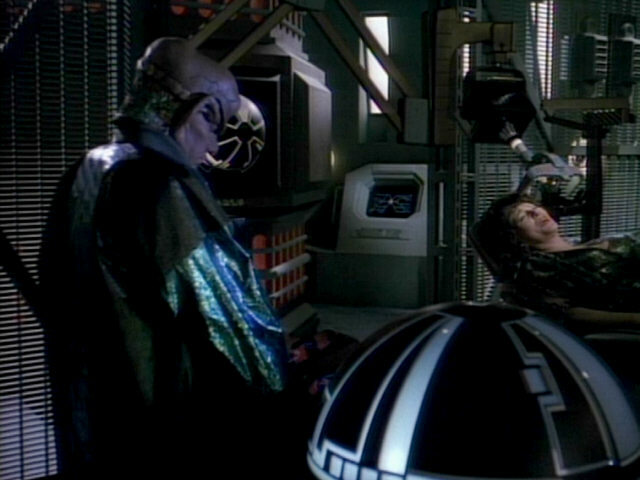 Ferengi doctor Farek also used it to torture Lwaxana Troi in "Ménage à Troi". 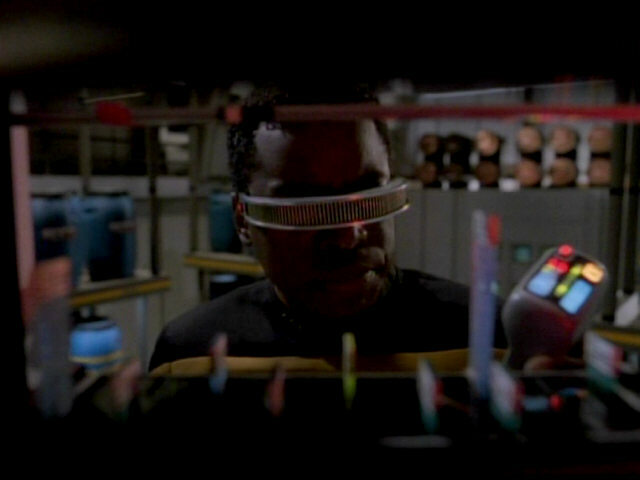 Filming equipment is visible through the sickbay door as Geordi and Data leave the set. 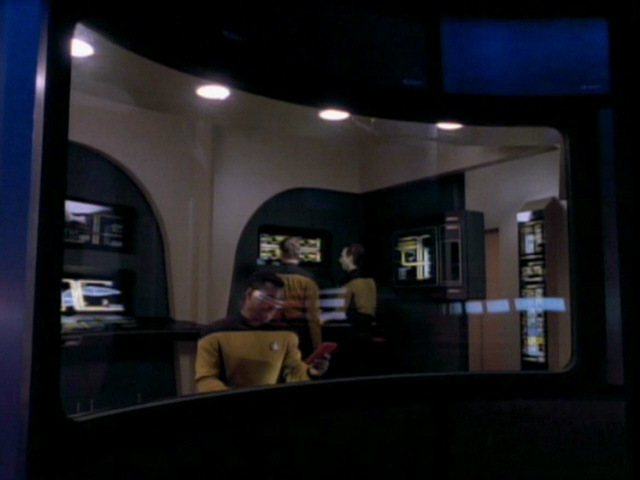 We can see the equipment in TNG-R as well. 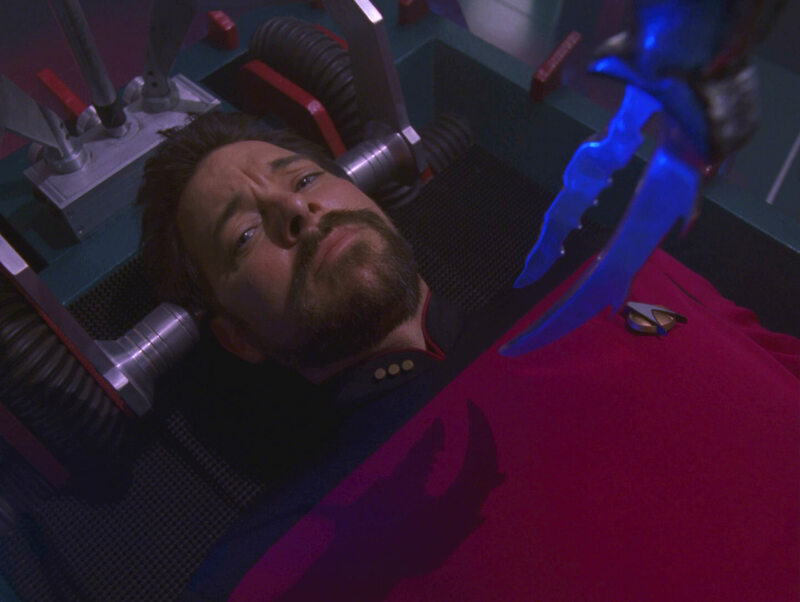 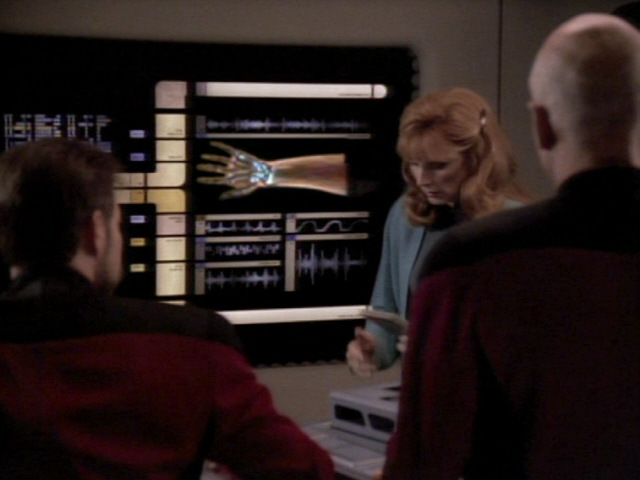 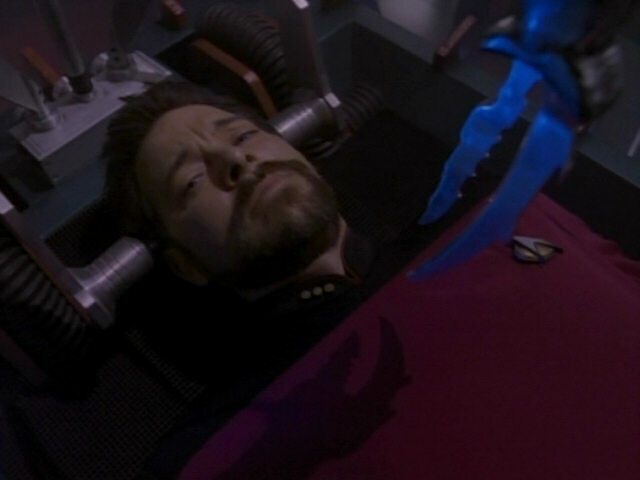 The scan of Riker's arm was added in post production. 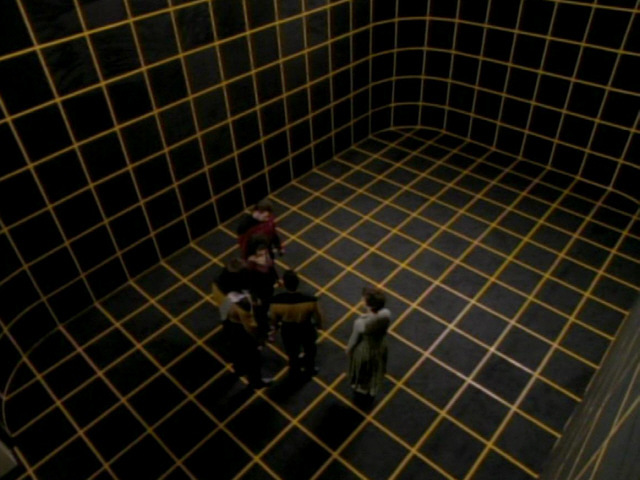 The effect was redone for TNG-R. 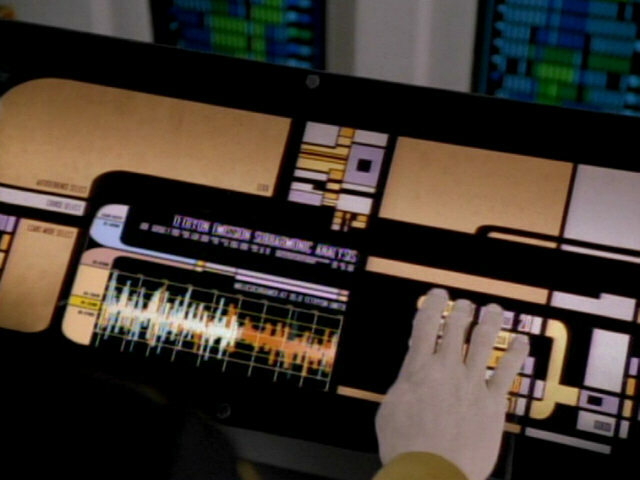 The LCARS panels in cargo bay 4 (also seen in "Disaster") were originally created for the bridge of the USS Sutherland, seen in "Redemption II". 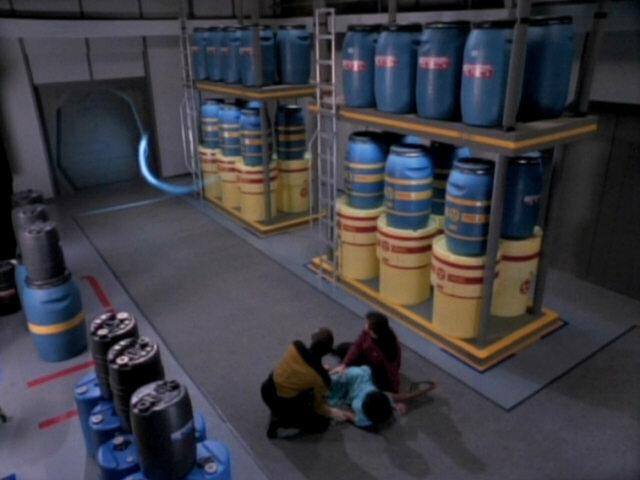 For "Disaster", the wall was turned upside down. 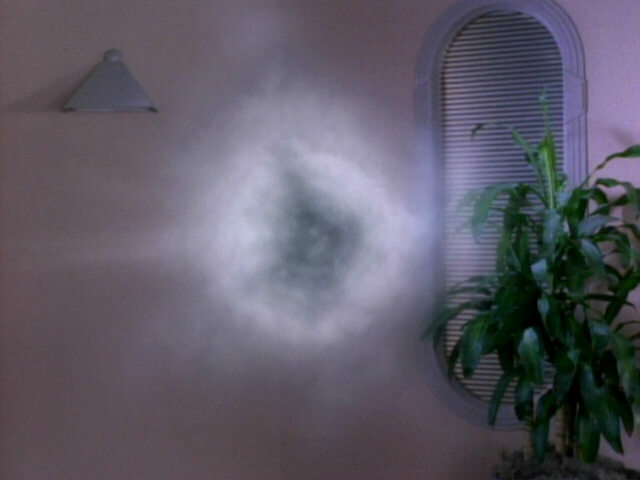 Here, it appears like it did in "Redemption II". 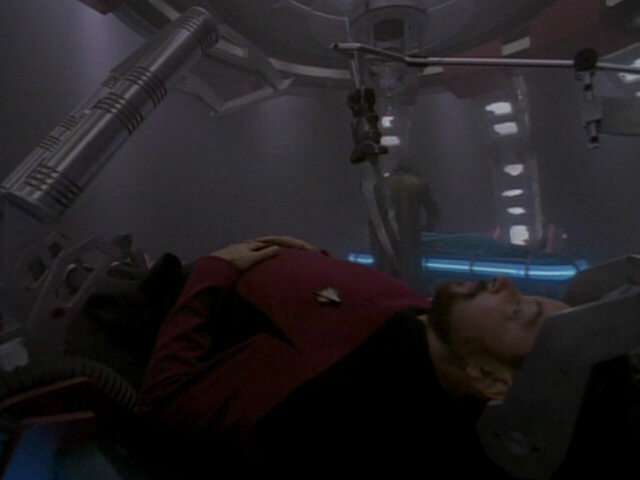 A subspace rupture has formed in the cargo bay. 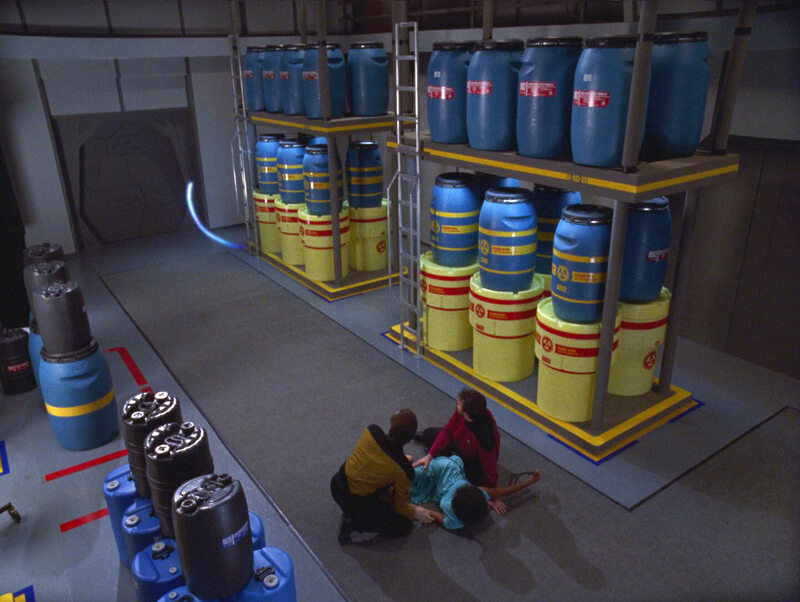 The reconstructed effect in TNG-R.
A nice look at the colorful cargo containers created for "Disaster". 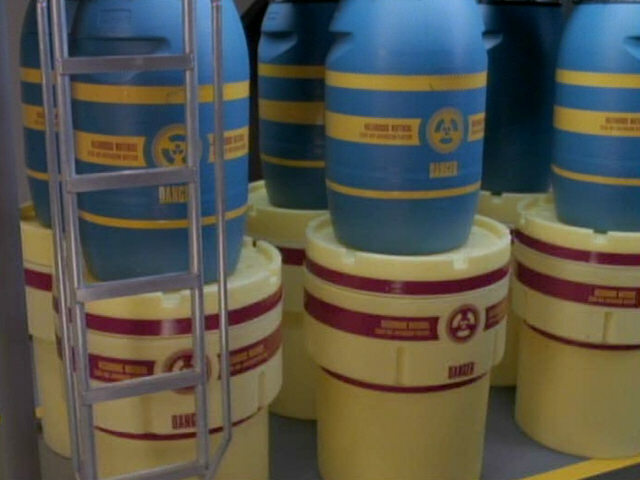 In HD, the labels are fully legible. 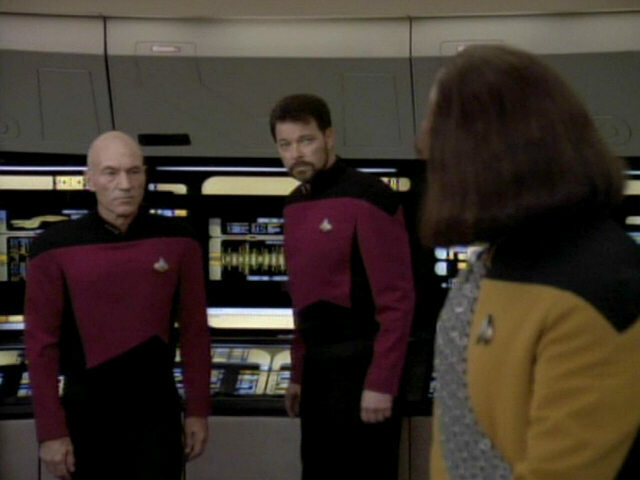 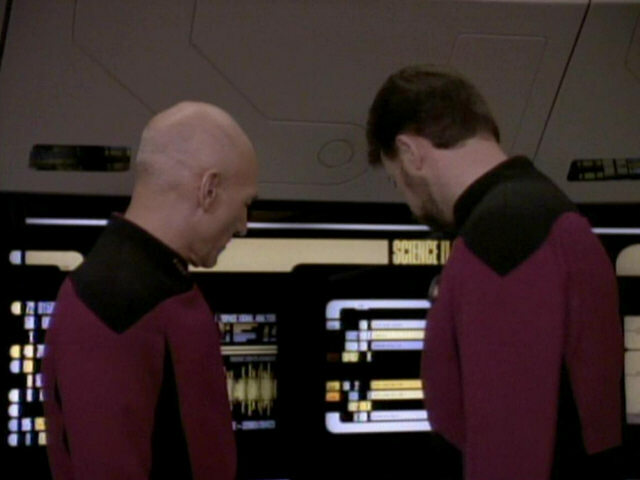 A graphic of the subspace signals can be seen behind Picard and Riker in these screenshots. 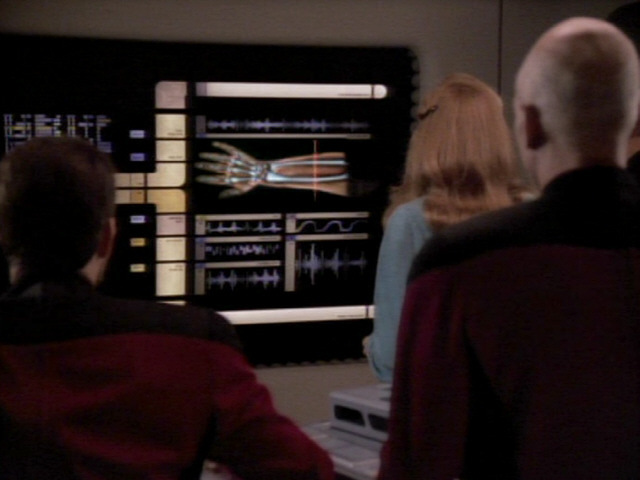 The graphic is almost identical to the graphic of Ferengi subspace frequencies seen towards the end of "Ménage à Troi". 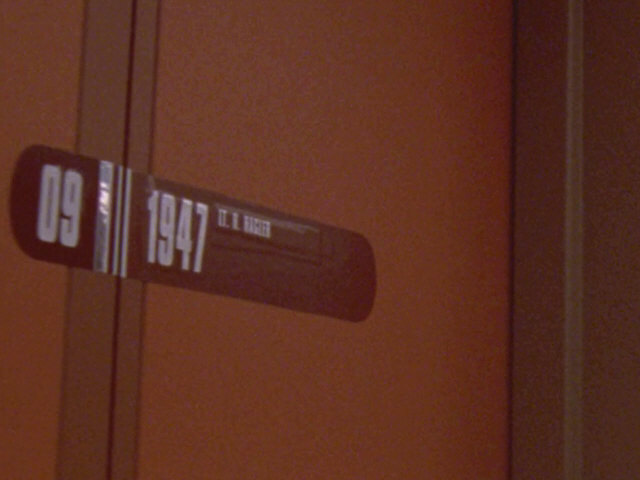 The door label on Lieutenant Hagler's door must have been changed numerous times over the years, as evidenced by the thick layers of tape. 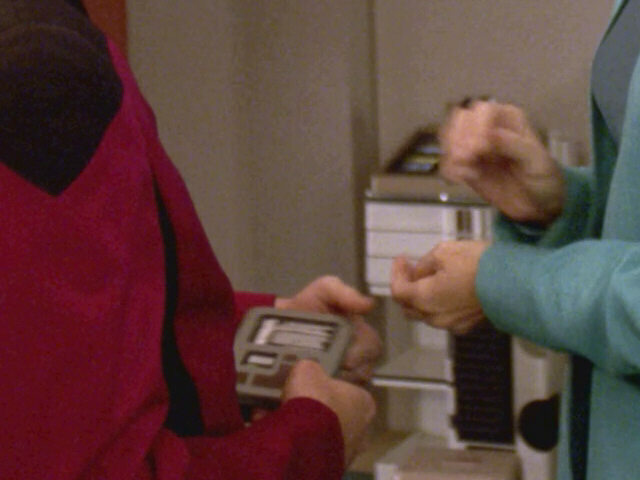 We can see the embossed label even better in HD. 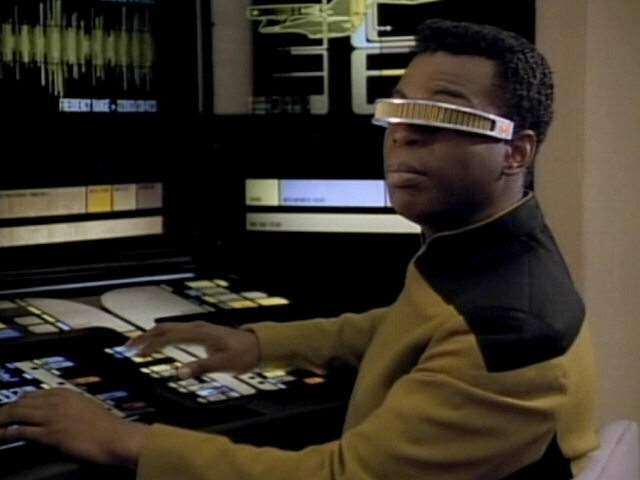 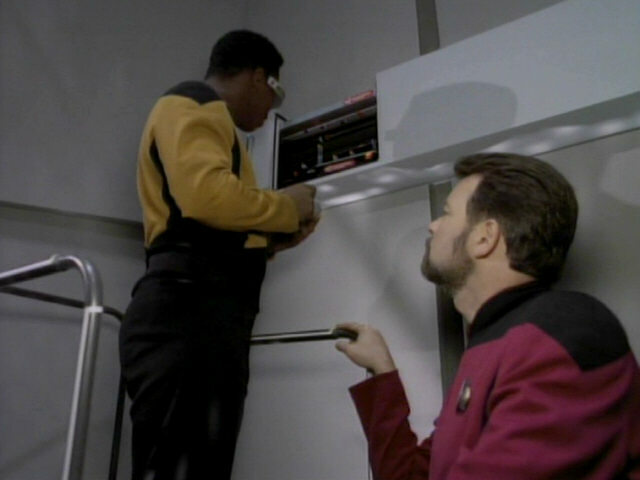 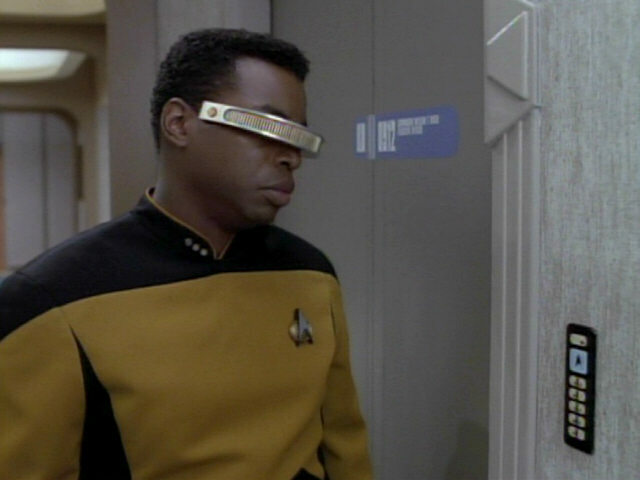 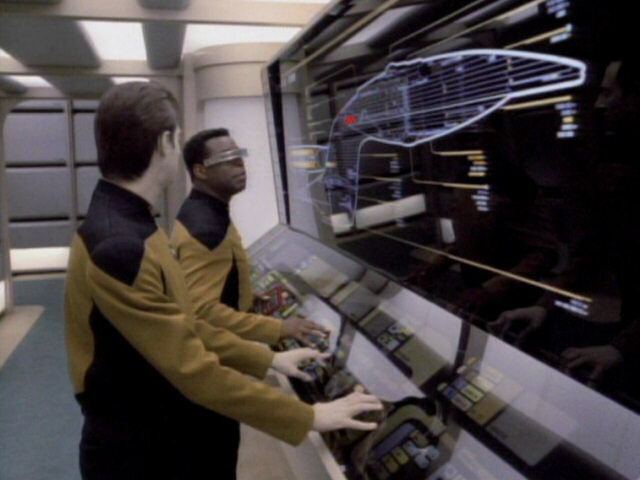 The homing device Geordi is holding here is the same prop that was used by Data in "Cause and Effect" to send information from one loop to another. 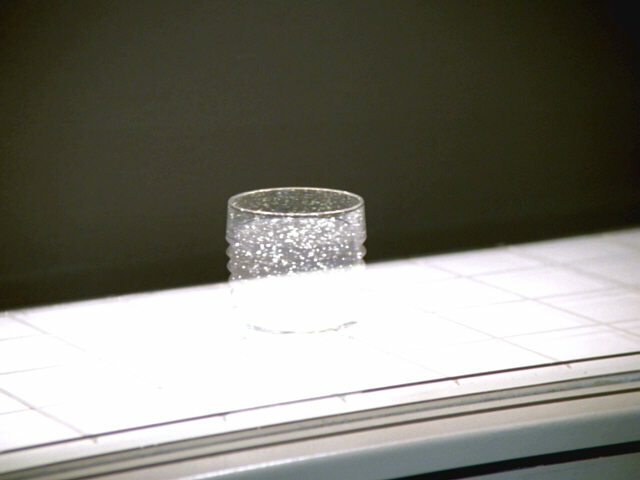 and Effect" The prop in HD. 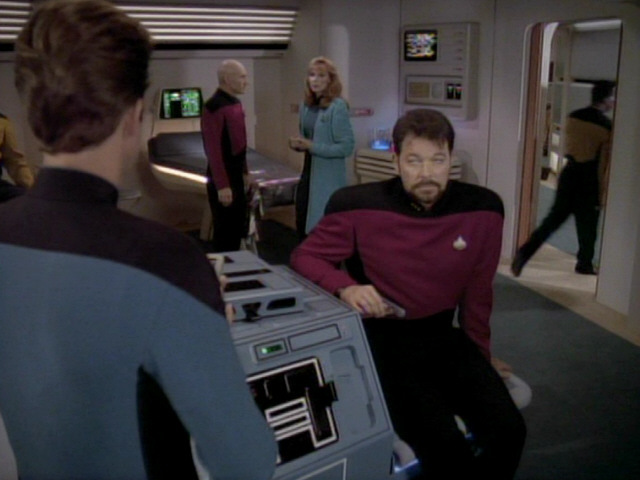 Riker is sucked through a subspace rift that has opened in his quarters. 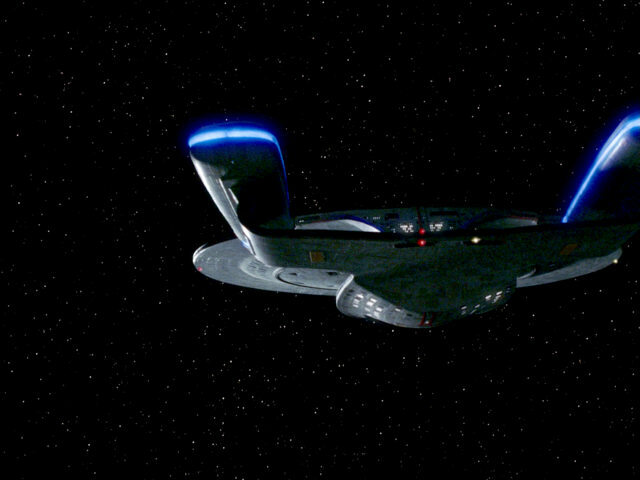 The effect was redone for TNG-R and looks more convincing now. 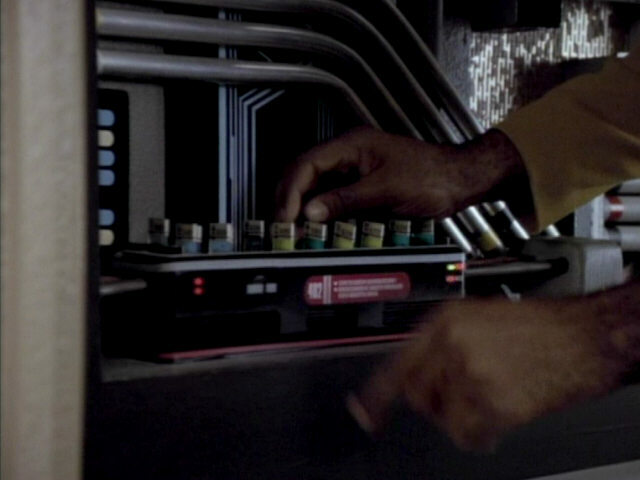 The strange alien device used by the Solanogen-based aliens was originally a superconductor magnet (SCM) model 3, as seen and identified in "The Dauphin". 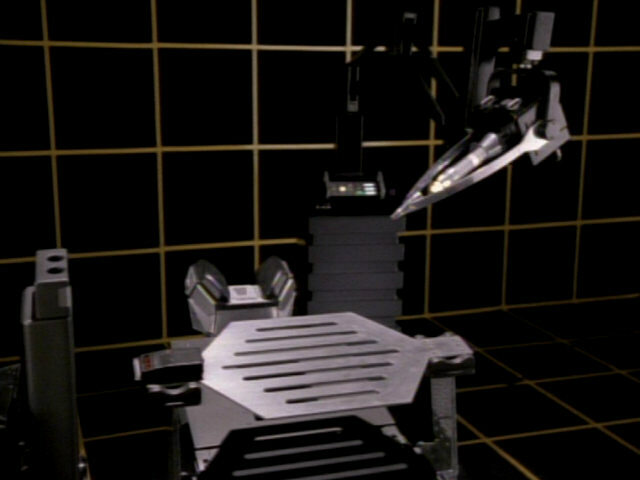 It was later seen in Riker's quarters in "Conundrum" and the Voyager episode "Prime Factors" it was reused as the Sikarian spatial trajector. 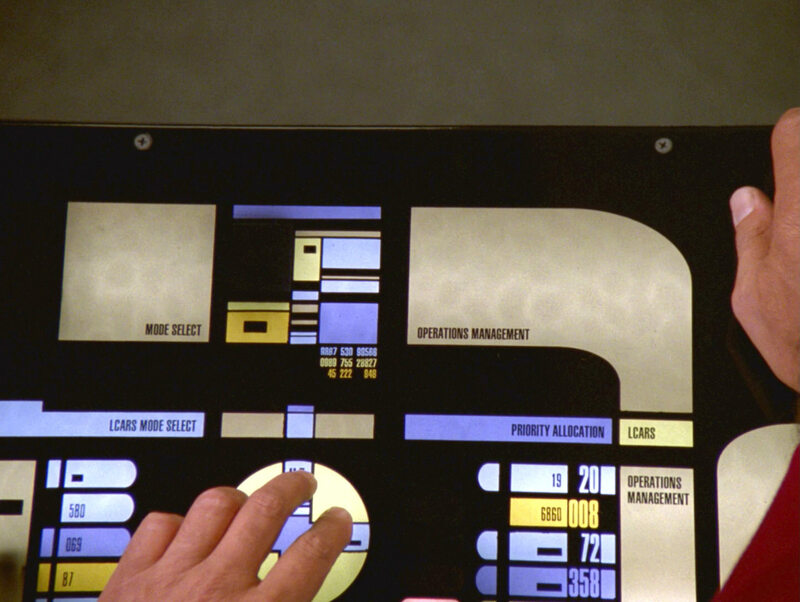 Factors" The device can be seen much better in HD. 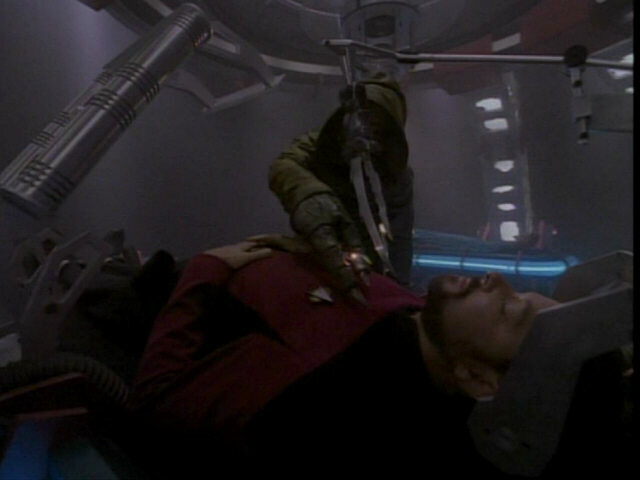 It looks like the alien scissors seem to be attached to a normal knife hilt. 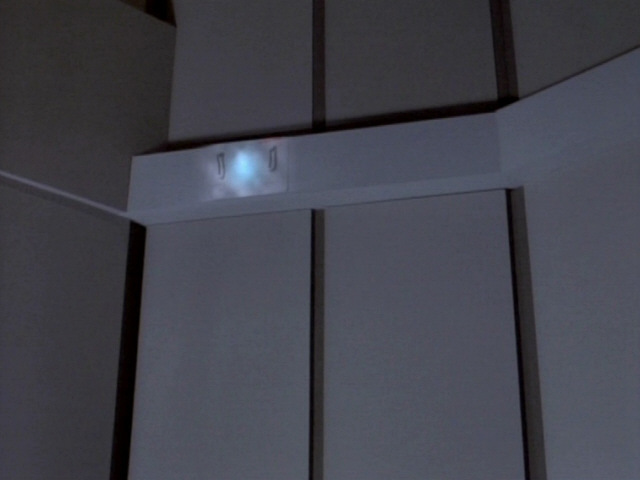 The alien devices in HD. 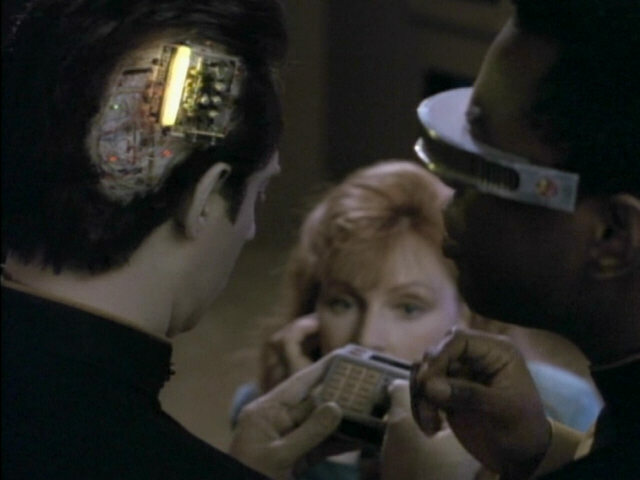 The same device the aliens use here to scan Riker was used by Data to open Lal's skull in "The Offspring". 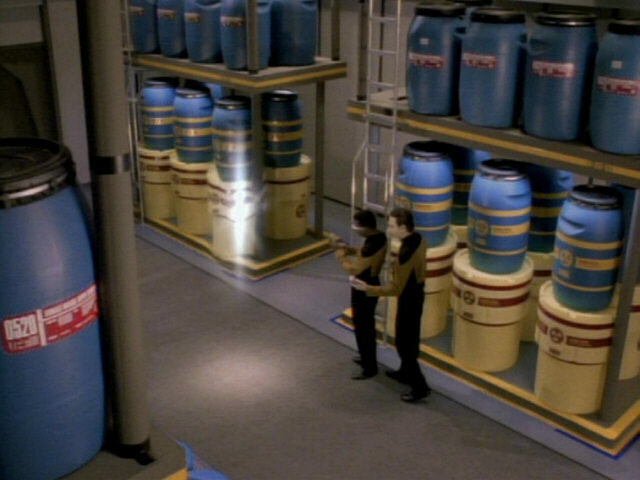 The wall in the background is covered with the same material that also covered the corridor walls on Deep Space 9. 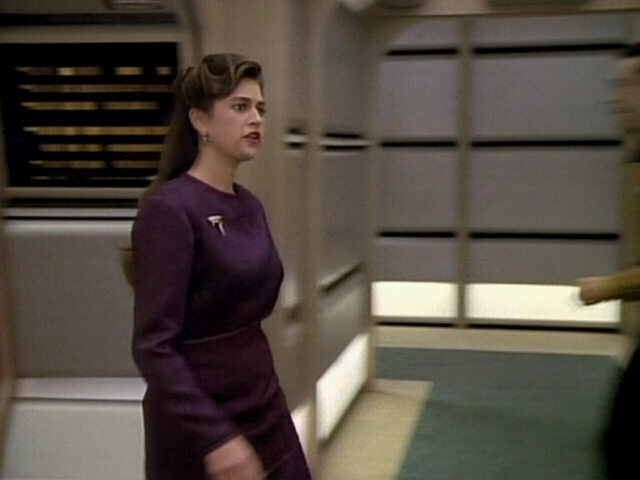 DS9: "Dax" The wall can be seen better in HD. 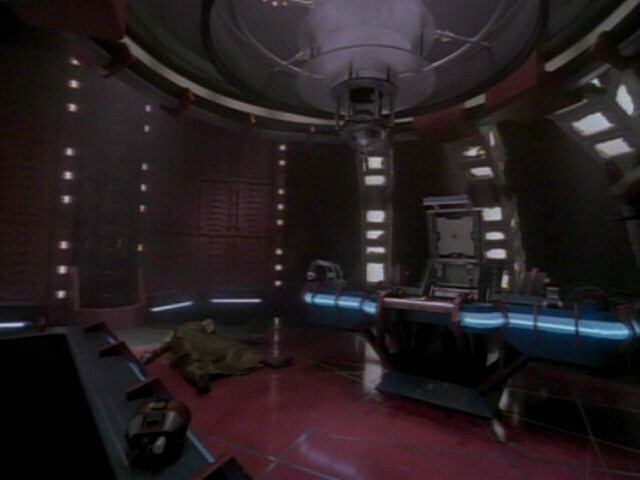 The subspace rupture as seen in the laboratory of the Solanogen-based aliens. 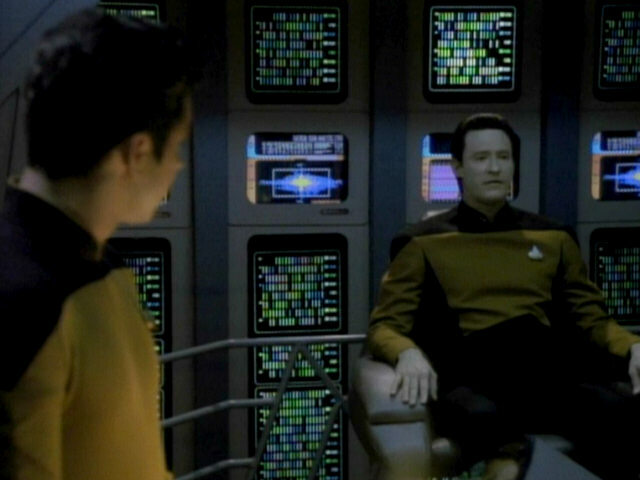 The effect in TNG-R.
A graphic showing tetryon emissions is seen in this screenshot. 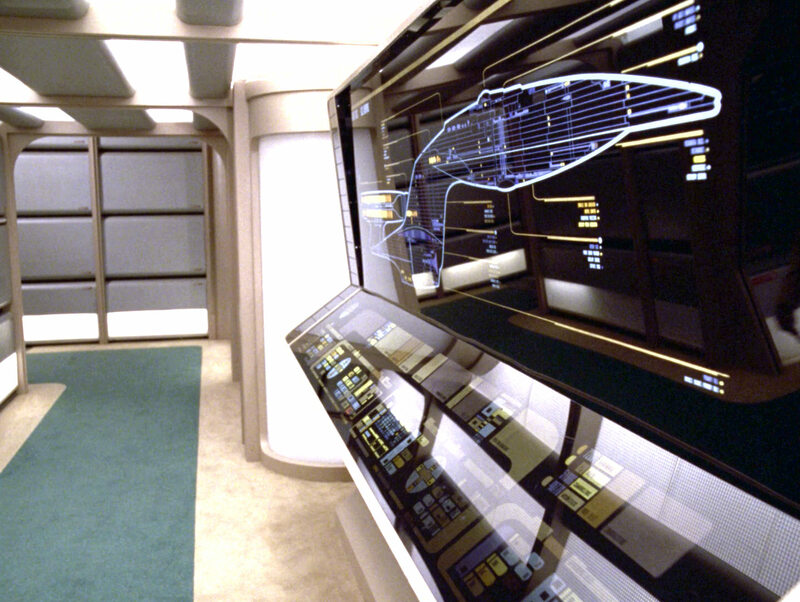 The graphic in HD. The Solanogen-based aliens are seen up close in this screenshot. 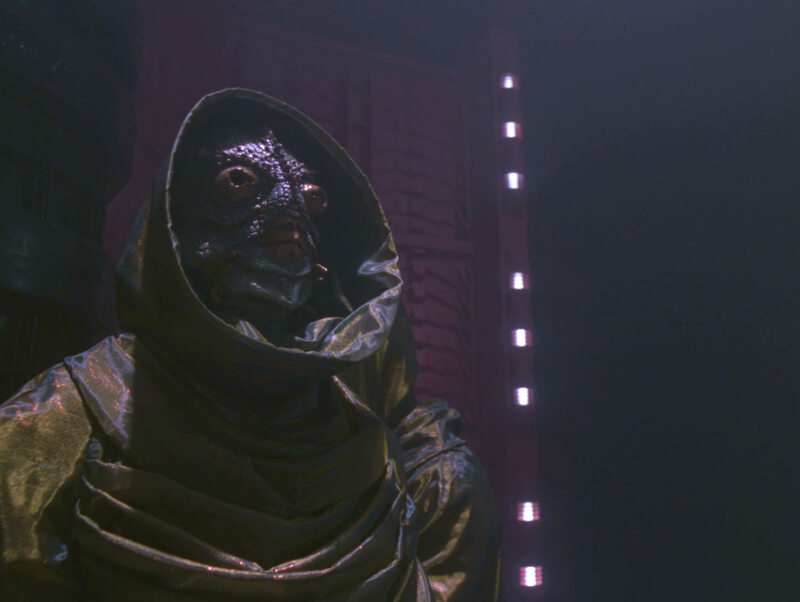 A good look at the alien in HD. 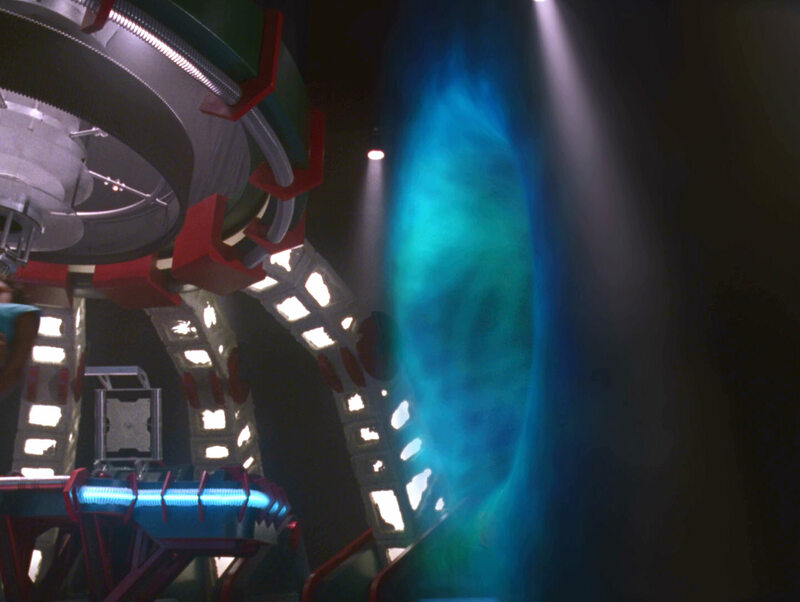 These five screenshots nicely illustrate the appearance of the alien laboratory set. 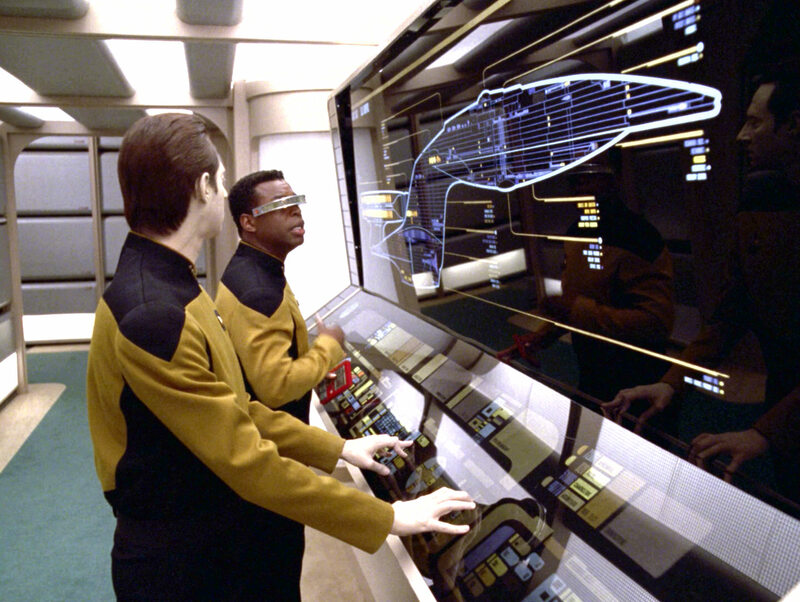 The ceiling structure, with the layers of semi-transparent plexiglass was originally created for "The Nth degree". 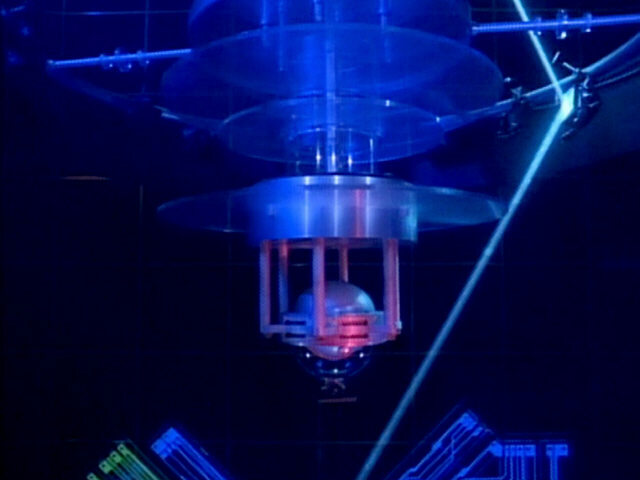 The bottom part of the ceiling device, with the metallic sphere and the beam emitter was also seen in "Ethics". 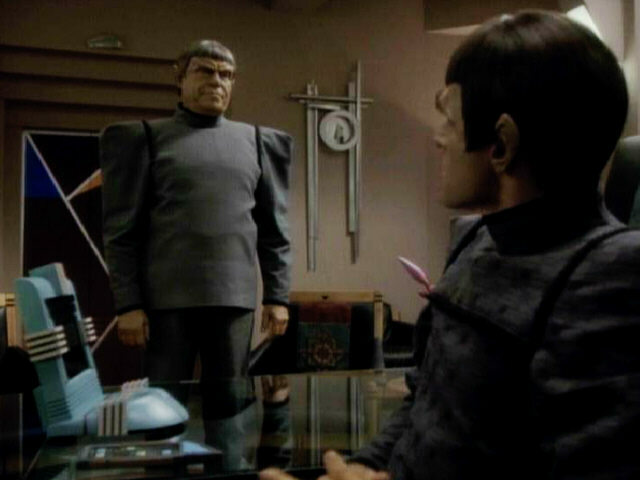 It was modified from a prop originally created for "Ménage à Troi". 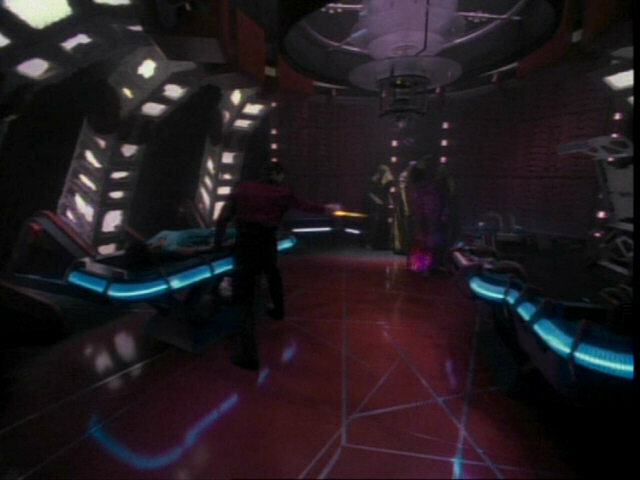 In the third screenshot, Riker fires a phaser at one of the aliens, who is then engulfed by a purple glow. 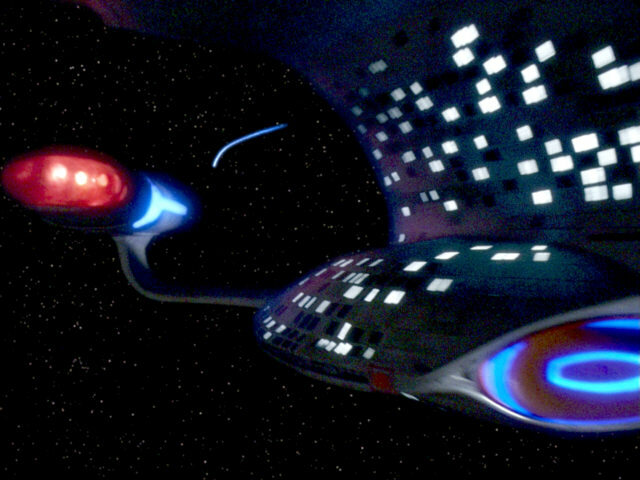 "Ménage à Troi" The set in HD. 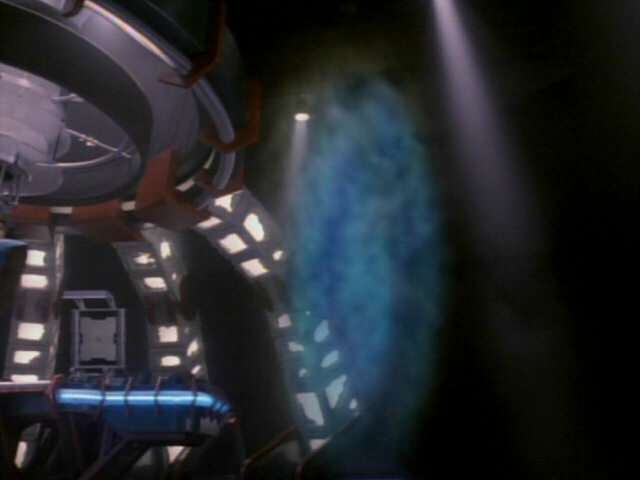 Filming equipment is visible on the left as the aliens send something through the subspace rupture. 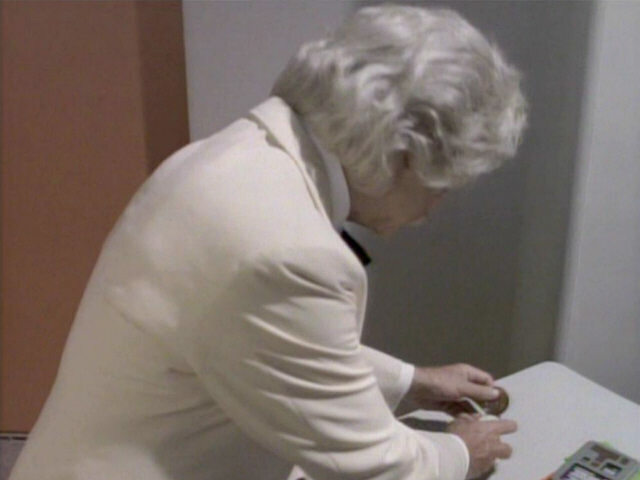 We can see the caster in HD too. 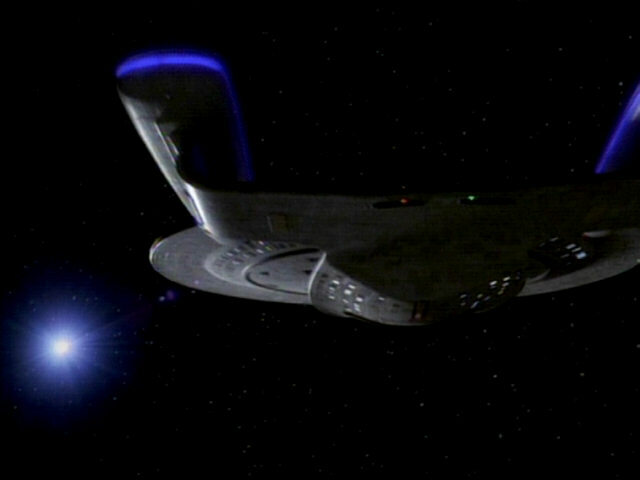 The alien energy leaves the USS Enterprise-D behind. 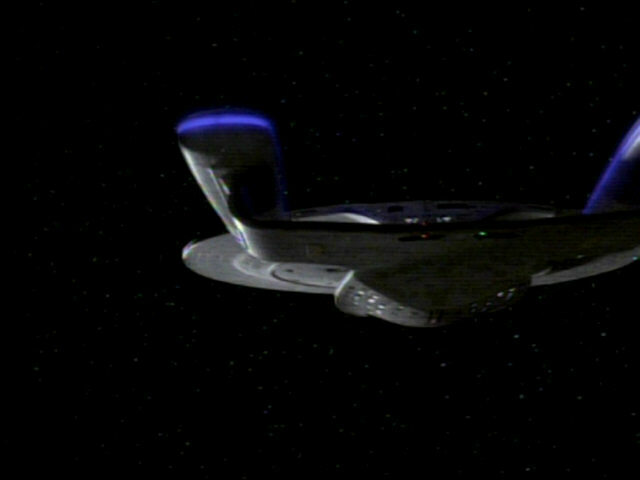 The shots of the ship in HD. 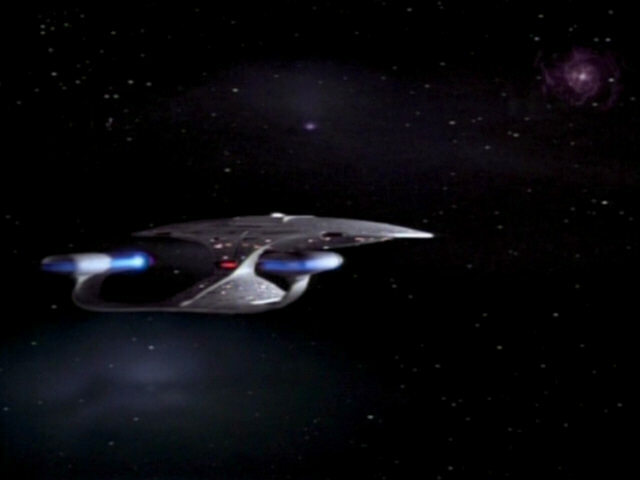 This shot of the USS Enterprise-D has prominently appeared in "Allegiance" and "The Game", where the ship was seen approaching the Lonkar and Phoenix clusters respectively. 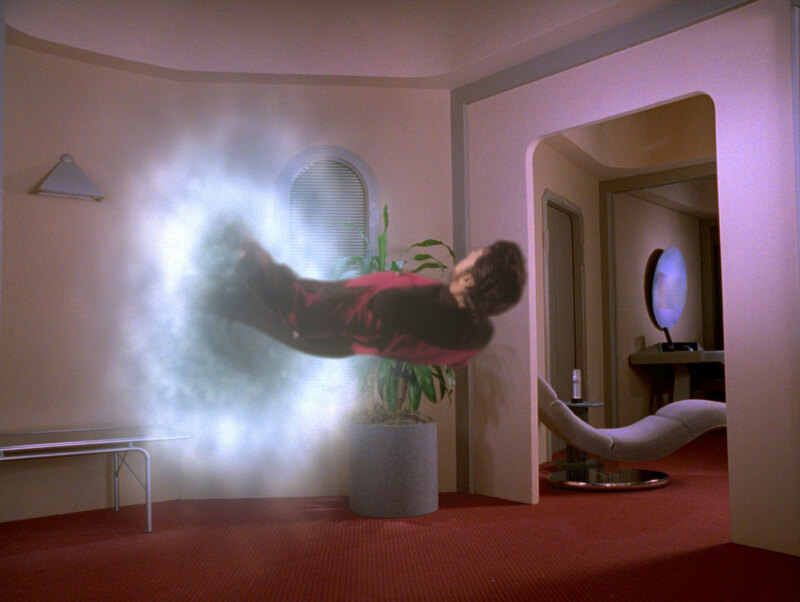 In this episode, the Enterprise-D just flies through empty space.